My world is always transformed during a snowstorm and even the day after. So it was that yesterday about four inches of the fluffy white stuff drifted down and created a wonderland effect. In almost direct registration, a hind foot of the fox landed on snow previously packed down by the front foot, so what you see are the two prints. The top print was a bit fuzzy in formation for so much is the hair on the fox’s foot. Despite that, toe nails, toes and the chevron pad at the back, plus the X formation between toes and pad seemed obvious. As I made my way through the park, the morning light on Stevens Brook drew me off trail to the frozen edge. And ice along the bank indicated the change in water levels since the heavy rain of a few days ago. At last I reached the gateway to town, which is also the gateway to the park–the Bob Dunning Memorial Bridge. 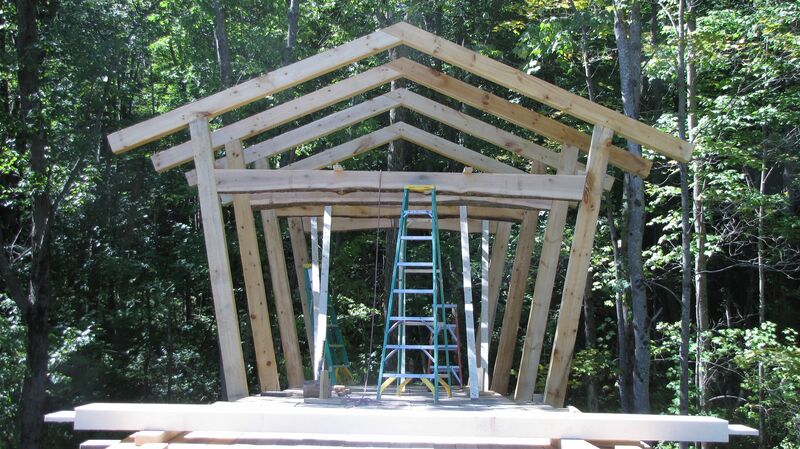 I have a great fondness for this bridge on many levels, including memories of Bob who passed away suddenly at least ten years ago, the barn-raising community effort to build it, and the fact that each beam represents a different tree, bark included. 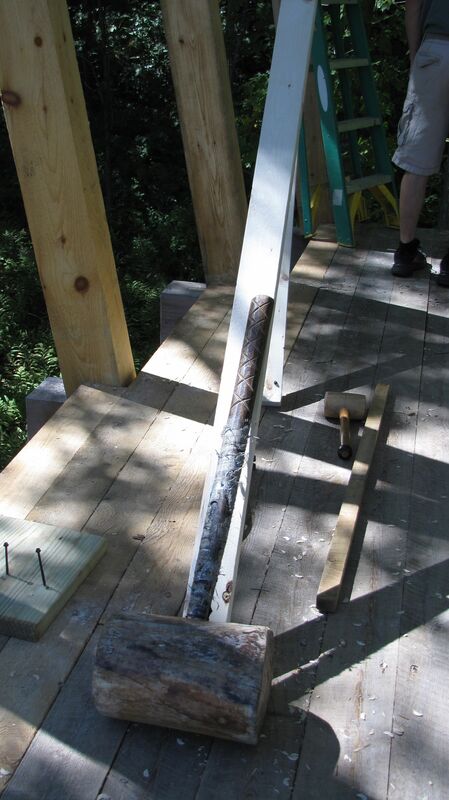 You can learn more about it by reading my previous blog post: Barking Up A Bridge. And each time I walk across it, it seems to offer up something different. This morning, it was how the snow coated the railing. I think the artistic side of Bob would have approved. On the other side, I met up with a group of seven women. 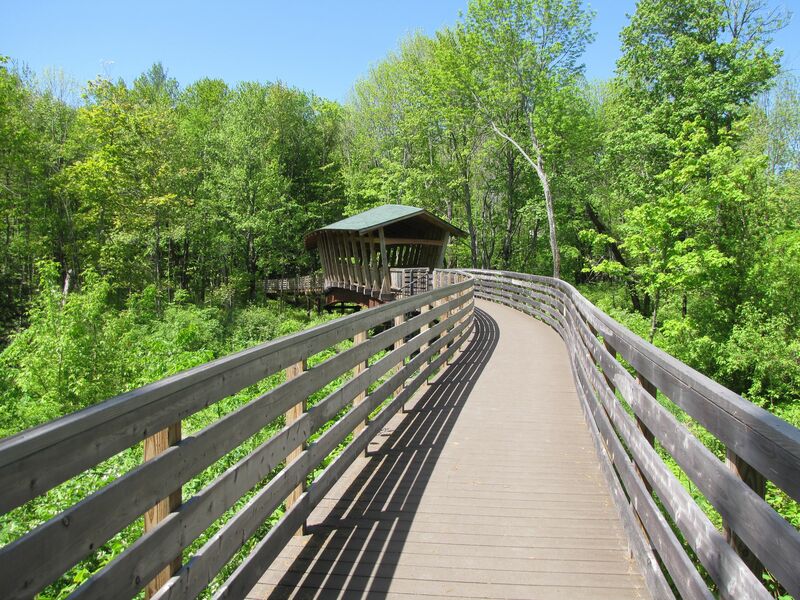 Led by AMC volunteer JoAnne Diller, our intention was to tramp through the park following all the outer loops, including a link on the Lake Environmental Association‘s Pinehaven Trail at the Maine Lake Science Center. Along the way we visited with each other, enjoyed the beauty that surrounded us, and got some exercise. And then we returned to the bridge and parted ways. 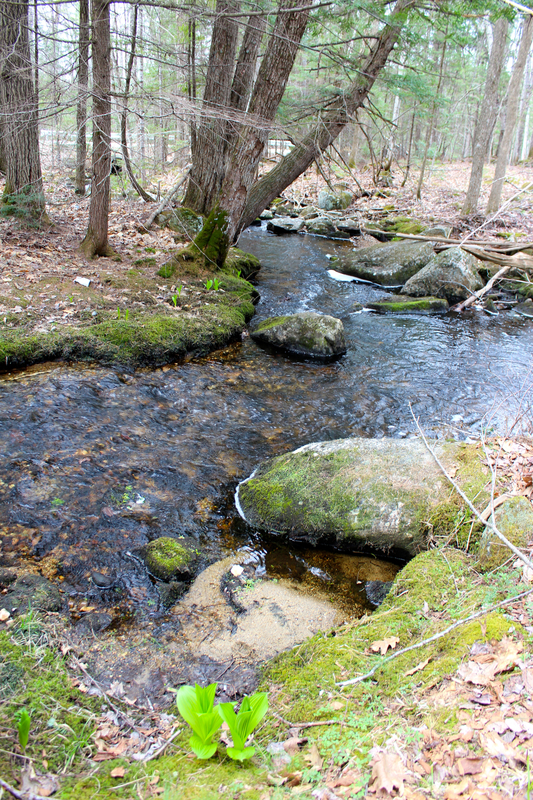 I choose to follow the inner trails home, pausing first to enjoy the color of Stevens Brook from the bridge’s center. And no winter visit to the park is complete without taking time to watch the ducks–and listen as well. They gather by the dozens, some to rest while others seemed to be in constant motion. Before following the trails leading west and toward home, I returned to the scenic overlook where ice skirted a tree–again indicating that the water was recently much higher. In the same spot I watched water swirl in a small eddy and am amazed that I’m not still standing there–mesmerized as I was by the action. 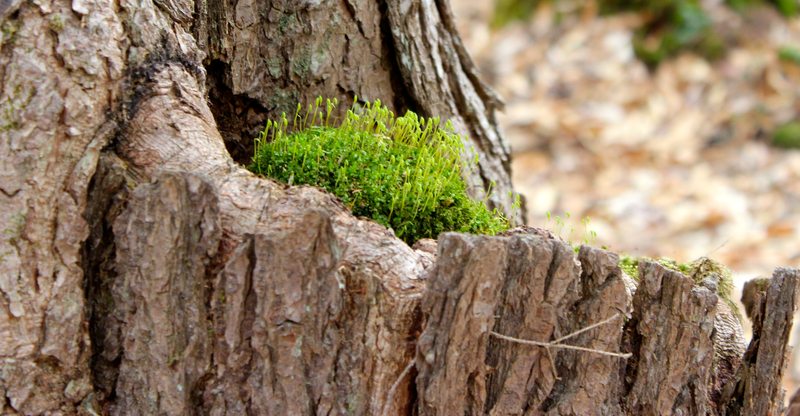 But my stomach was growling and so I continued on–stopping to admire another of nature’s wonders–a yellow birch that germinated atop an old pine stump and today stands as a sculpture of one member of the community supporting another despite their differences. Hmmmm. The trail I followed home was less traveled than the others and the snow a bit deeper because it hadn’t been packed down. 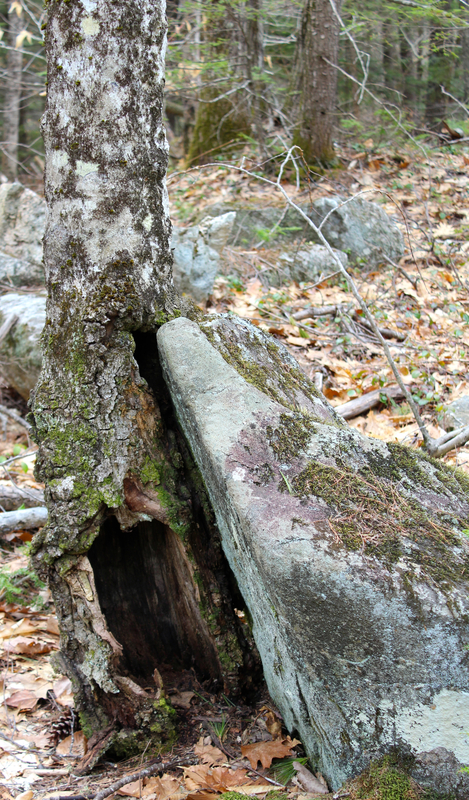 When the park was first created by Lakes Environmental Association and Loon Echo Land Trust, the AMC did some trail work and part of their offering was this bench. Though it hasn’t recently supported a weary traveler or one who just wants to set for a time, I trusted that day will soon come again. 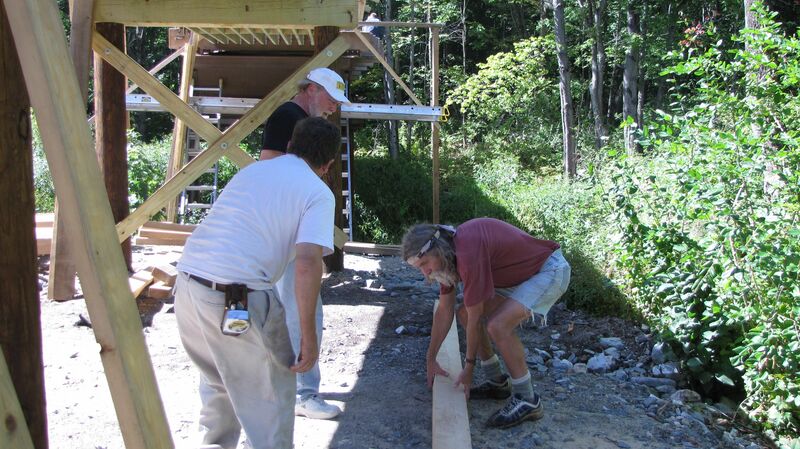 I crossed the bridge near the bench, which was also built by the AMC crew. And from there, I headed home to lunch, but not without offering a smile of gratitude to JoAnne for continuing to volunteer to lead walks for the AMC and giving us all an excuse to enjoy the company of each other in this beautiful place. Later in the day I found myself in Lovell for a quick errand and the light was such that I felt the need to spend a little time beside the Old Course of the Saco River just down the road in North Fryeburg. The scene is never the same, nor is the light. What may have seemed monochromatic was hardly that. As the sun began to set, the water still harbored reflective moments. And it transformed some reflections from crisp representations into impressionistic paintings. At the end of the day, however, my favorite reflection of all was one spied along Willet Brook in Pondicherry Park by Eleanor, a member of our morning AMC trek. In this morning’s newspaper I read an article about the loss of natural sound because we have created so much people noise. It took me back to a time about forty years ago when I think I first actually paid attention by sitting alone in the woods and listening–hearing the soft rustle of grass blades, chirp of the crickets, buzz of mosquitoes and vroom of a truck in the distance. I can still envision that spot on a hillside where I closed my eyes to the sun and tried to zone in only on sound–to let go of the rest of the world and focus on that one sense. And so I took that thought with me this morning when I joined others to bird at the Bob Dunning Bridge, one of the entrances to Bridgton’s Pondicherry Park. Truth be known, I also went birding at the bridge early yesterday morning when the sun shone brilliantly and a yellow-rumped warbler posed for an instant. Today dawned raw and overcast. And at first, the birds weren’t all that song-filled or even evident. But then we heard one on high and our natural high kicked in. A Baltimore oriole whistled its melodious tune and we swooned. We watched an Eastern phoebe flick its tail as it looked to the right . . .
and then to the left. Because of the morning’s chill, the bugs upon which it feeds seemed non-existent to start. But, perhaps it knew otherwise. What we knew was that the temp climbed a wee bit and bird song increased, including that of the ever sweet song sparrow. Yes, we could hear the sounds of this sleepy, western Maine town since we were only a block from Main Street, but the songbirds shared their voices and for us–we focused on those delightful tunes as we tried to figure out who we could hear but not see. One such resident arrived this past week, like many other snowbirds (people residents who winter south of Maine– or is it south of New England?). We recognized the catbird first by its cat-like mewing and then we spotted two along the stonewall and in the brushy shrubs. Like all birds, however, they didn’t sit still. We did note, though, that they spent most of their time on the other side of the bridge in an area where they frequently nest. And speaking of nesting, the song sparrow moved from its perch to the ground where it joined others as they scratched about and filled their beaks with potential materials to add to their new home. I love that from above, it blended in with its surroundings. A good thing when you are but a wee bird. That being said, not all went undiscovered and we noted that some joules were passed from one bird to another–energy flowing through the cycle. Eventually, one of our favorites of the day moved closer and we watched it for some time as it worked upside down and then . . .
right side up. Again, we wondered if the oriole was working at the dried leaves and also seeking nesting material. And finally, a song a few of us heard when we first arrived showed its face–“Sweet, sweet, sweet, I’m so sweet,” evolved into a yellow warbler, or two or three. Because we were there and looking, other members of the world showed their faces, such as the flowers of Norway maples and . 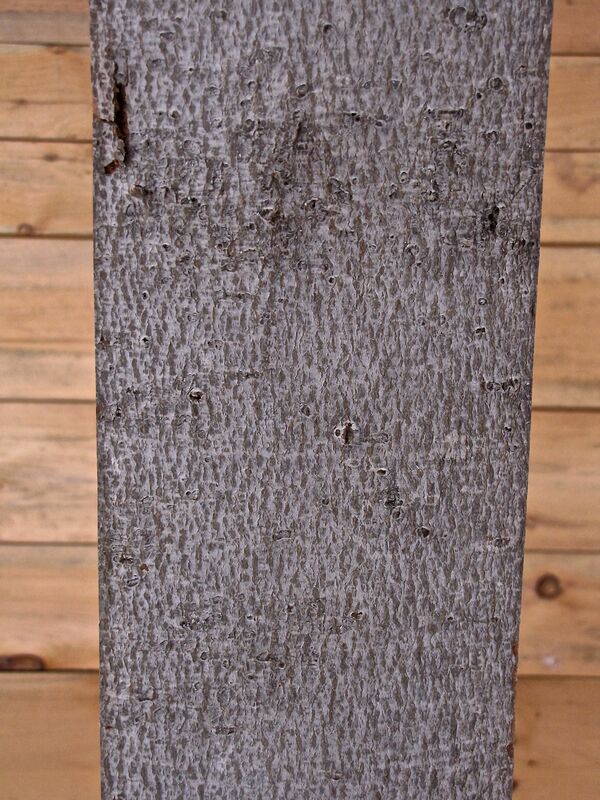 . .
We noted the emerging American elm leaves, already highlighting their sandpaper texture and asymmetrical base. And then we got stumped momentarily by the butternut (aka white walnut ), but it’s the eyebrows above the monkey face leaf scar that spoke to its name. Less than a month ago, Jinny Mae and I discovered its cousin, black walnut at Narramissic. 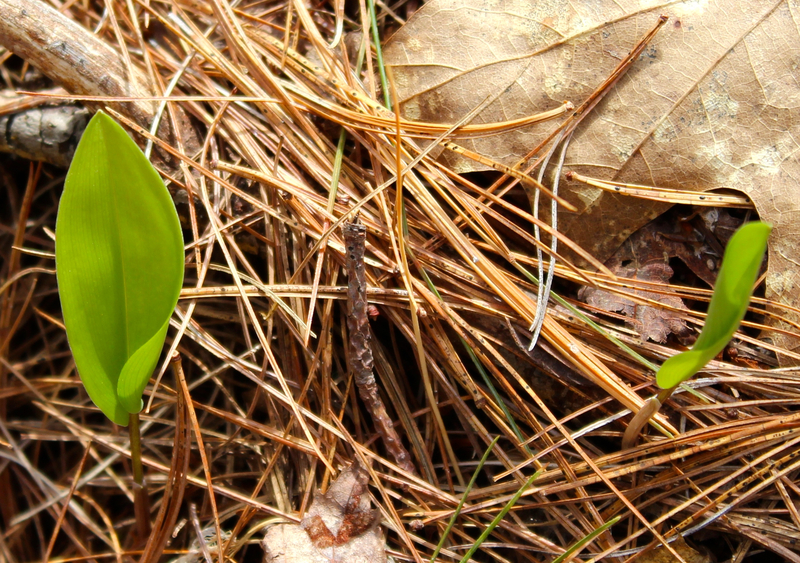 Both are not all that common in the woods, but both grow in places where human impact is more evident. That being said, human impact is evident the world ’round. Eventually, all good things must come to an end and it was time for those gathered to move along into our days. But . . . we’d had the joy of spending a couple of early morning hours, whether in the sun or not, coming into contact with sight and sound and texture. We’d met the actual world and we loved making its acquaintance. 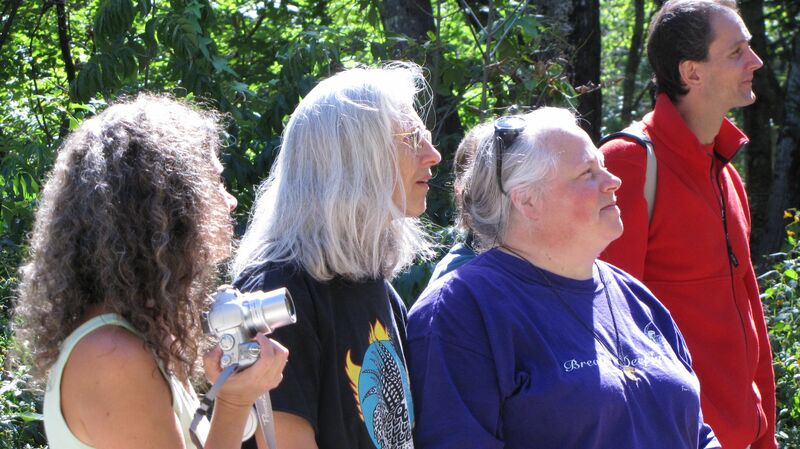 Thanks be to Mary Jewett of Lakes Environmental Association for offering these community birding events. And for her patience with us amateurs as she teaches us the finer points of identification. As I write, snow flurries float earthward landing atop the almost two feet of snow we received yesterday. Perhaps I should have heeded the soothsayer who warned Julius Caesar to “Beware the ides of March,” in Act 1, Scene 1 of Shakespeare’s play about the Roman politician. But I didn’t. I stepped out the door this morning and took my friend, Judy Lynne, with me for today is her birthday, thus making March 15 a day of celebration rather than one to be dreaded. As for “ides,” that word refers to the day in the middle of the month. Every month has a day that divides it in half, therefore, every month has an ides. But still, in the play it sounds so ominous–and is eventually. And as for Judy, she missed the blizzard (and all our winter weather) because she teaches in China. And she is not at all like the Roman soldiers. Rather, Judy embraces every person and critter around the world and sheds love wherever she goes. 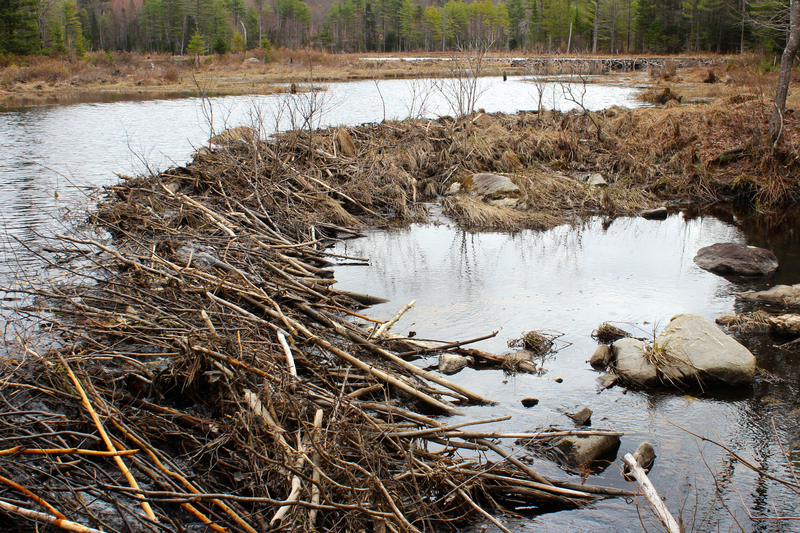 Since she can’t be in western Maine to enjoy the results of a late season storm, she’ll have to travel vicariously–beginning with the porcupine who didn’t let a little snow stop him from plowing through. Those of us who know Judy travel in a similar manner as she shows us parts of the world we may never actually visit. The view of Mount Washington will help her get her bearings. It is this and Pleasant Mountain and our orientation to them on the horizon that help us recognize our place in the world. I didn’t expect to see many tracks this morning, but was pleasantly surprised. Besides the porcupine, I saw deer, mouse, red and gray squirrel, chipmunk and these. I can’t give you lobsters for your birthday, Judy, but I can give you the lobster-like prints of snowshoe hare. I often don’t know where I’m headed when I walk out the door, and today was no different. This journey took me into Pondicherry Park where I stopped by the AMC bridge and thought about Judy’s ability to cross bridges with people of other cultures, no matter how deep the snow may be. Today, however, if she wanted to pause after making such a crossing, she’d need a shovel, such was the depth on the bench by the bridge. Together, we headed down the trail to the viewpoint beside Willet Brook. Judy is an artist and I had visions of her recreating this scene of winter snow and spring ice. This picture of transitions reminded me of the changes in her life as she interviews for jobs in other countries. The change will be difficult as she leaves behind friendships formed in the last five years, but I trust in reflection she’ll know she’s making the right choice. As I snowshoed, I found a few things I knew, but didn’t necessarily understand. Bumps in the road you might say, Jude, or at least on the spore surface of a false tinderconk. Because she loves design and has an insatiable curiosity, I knew she’d enjoy taking a look at the shield lichens, both hammered and common green. 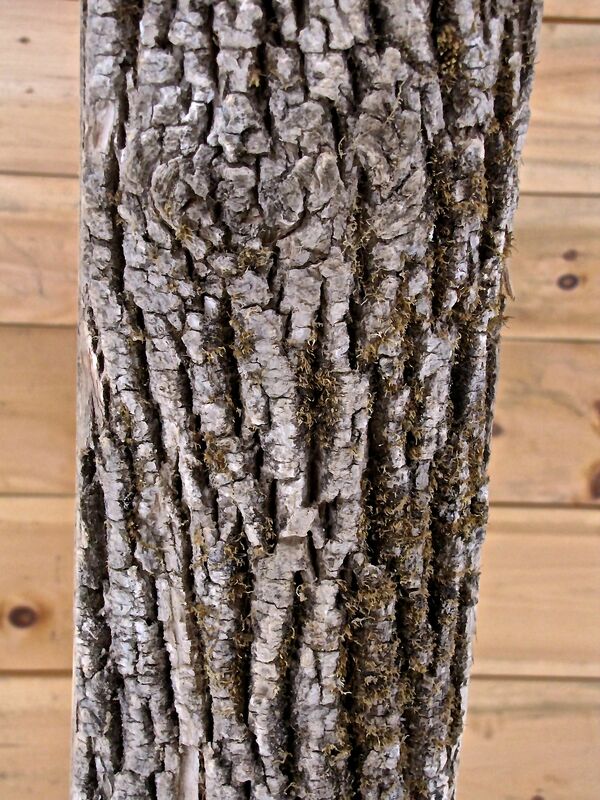 And that would have brought her to notice something else on the bark. She’d have laughed as I stuck my chin against the tree to get a closer look at the silky-hair cocoon embedded on the lichen. Perhaps a tussock moth? As I wound my way back, I checked Willet Brook again–and spied a hooded merganser swimming away, its crest described as a hammerhead. Hammershield, hammerhead. Methinks Judy will nail down a new job soon. 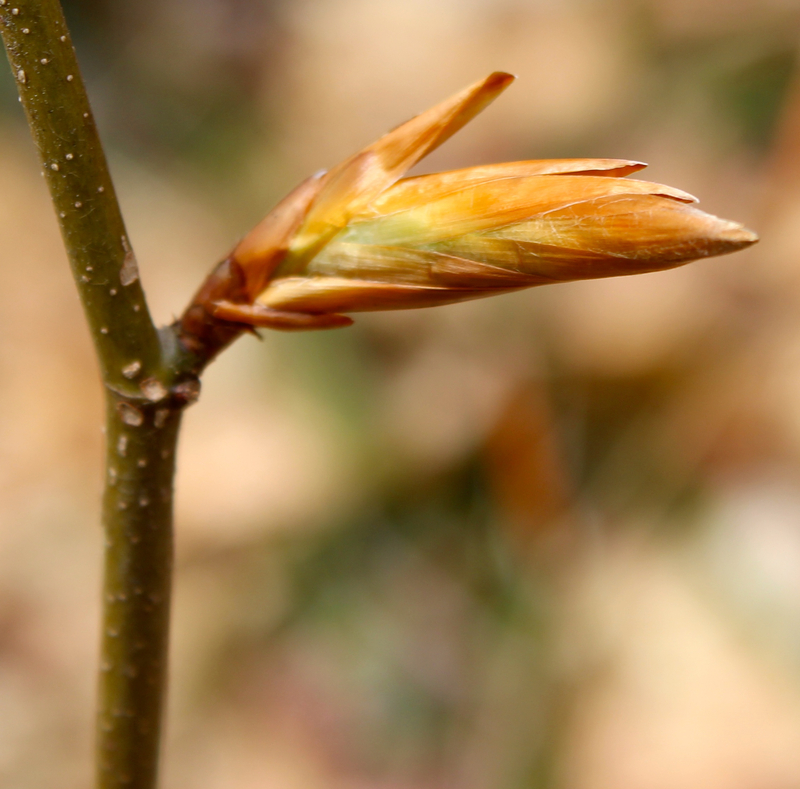 And then there was the beech bud already breaking–I’ve seen this happen in previous years; a few scales bursting open before their time. For Judy, it would have turned into a science lesson for her Chinese high school students. And perhaps a drawing lesson for art class. Throughout the park, I didn’t roam alone for deer tracks were obvious everywhere and I saw three of the creators. But it was the leaves atop the snow that made me pause and I’m sure Judy would have done the same. Occasionally I spot a single withered maple leaf on a tree, but this tree was covered and it made no sense. 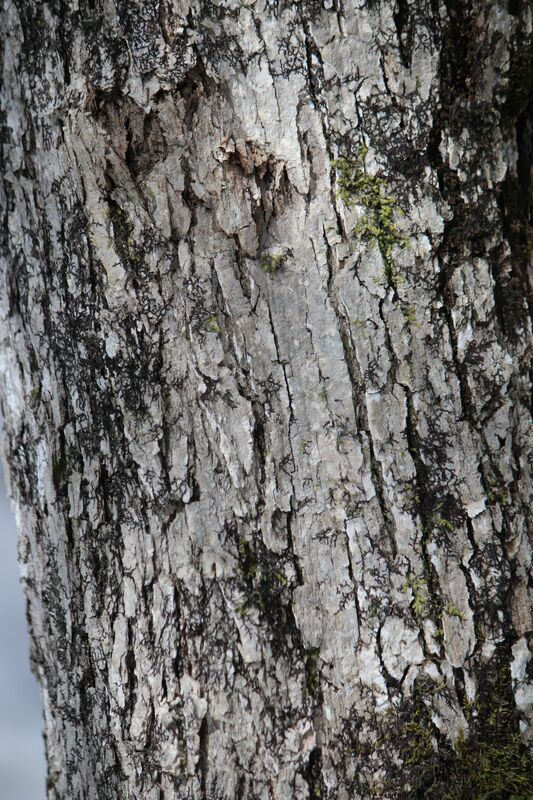 Maples aren’t typically marcescent–they don’t retain their leaves like beech and oak. It wasn’t until I stepped back and looked at the tree that I finally understood; this was a branch that had fallen when the tree was still in leaf and the deer browsed the tips of some branches, though I trust they didn’t find much nutrition for they moved on. I laughed again and heard Judy roar with me. At the stream below the spring, I noticed the deer had walked right through the water to get to the other side. I couldn’t tell for sure, but trust they sampled some wild watercress that grows freely there. And I thought of the foods Judy has sampled during her time in China and other travels. Not all of the deer chose to walk through the water. Some actually crossed the bridge. It struck me that they learned to use it to get to the other side. Judy has learned so much about herself and the world as she’s crossed bridges I’ll never set foot on. The best bridge of all awaited, its roof supporting the weight of the snow. 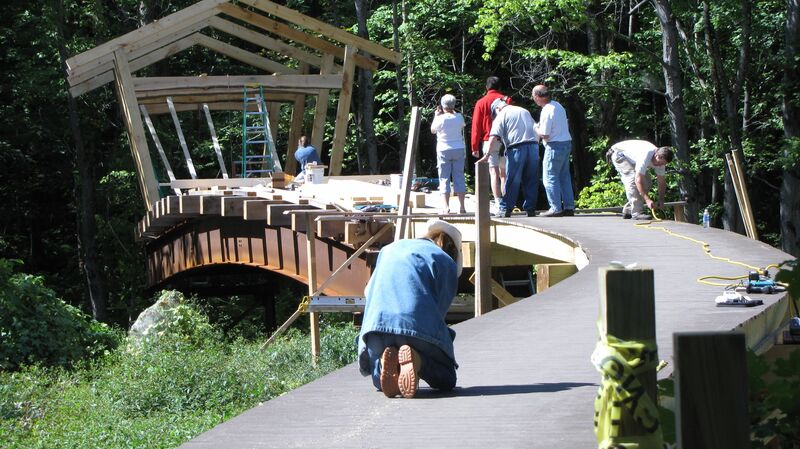 This bridge was built by many to honor a community member, whose wife just happened to be the reason Judy and I met 25 years ago. Wow–it’s been that long since we practiced breathing techniques in Lamaze class . One of the cool things this morning because I was the first one there, the peaks and valleys left behind by the storm. If she’d been here, Judy would have taken the very same photo. I went to the bridge to see the other ducks that frequent this location. The sight of the snow-topped rocks and vegetation made me think of frosting and guess who also teaches a cooking class–yup, Judy. Within the mix, what I think are two black ducks. I’m still learning my birds, but it did look like one may be a hybrid–a cross between a black duck and a mallard. Of course, I could be wrong on all accounts. No matter–what does matter is that they all get along and that’s what is important to Judy. She’s also a great believer in random acts of kindness and has performed so many good deeds for others. I was almost home when I saw some color in the gray birches–more color than the berries being eaten. A flock of robins dined on the “junk” food of the bird world–bittersweet berries. After one drank some snow, it showed off its rufous-colored breast, reminiscent of Judy’s red hair. In the end, today’s journey reminded me once again to Be Aware–the eyes of March. And be thankful. I am thankful for my friend, Judy Lynne, born on the Ides of March, but not actually reading this until the day after her birthday. I’ll be forever in awe of her. 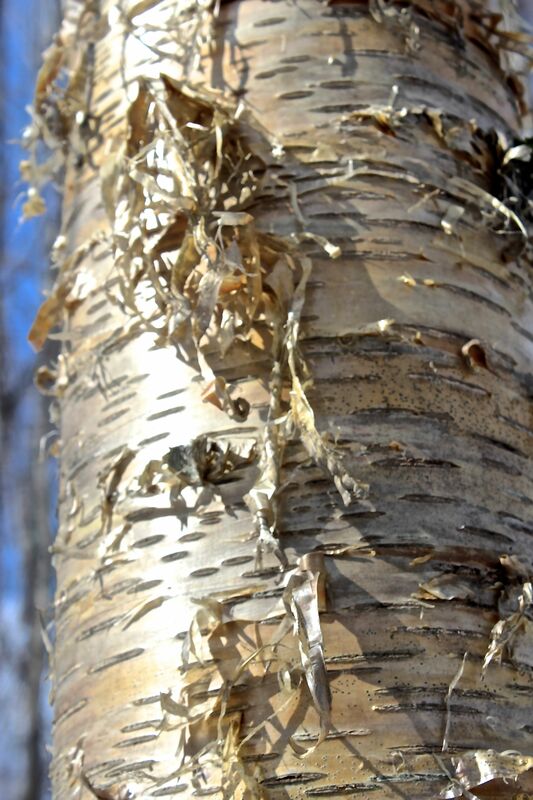 It was my journey through the Maine Master Naturalist class several years ago that lead me to this book of the month: BARK–A Field Guide to Trees of the Northeast by Michael Wojtech. The book actual evolved from Wojtech’s work, under the tutelage of Tom Wessels, toward a Master’s degree in Conservation Biology at Antioch University New England. 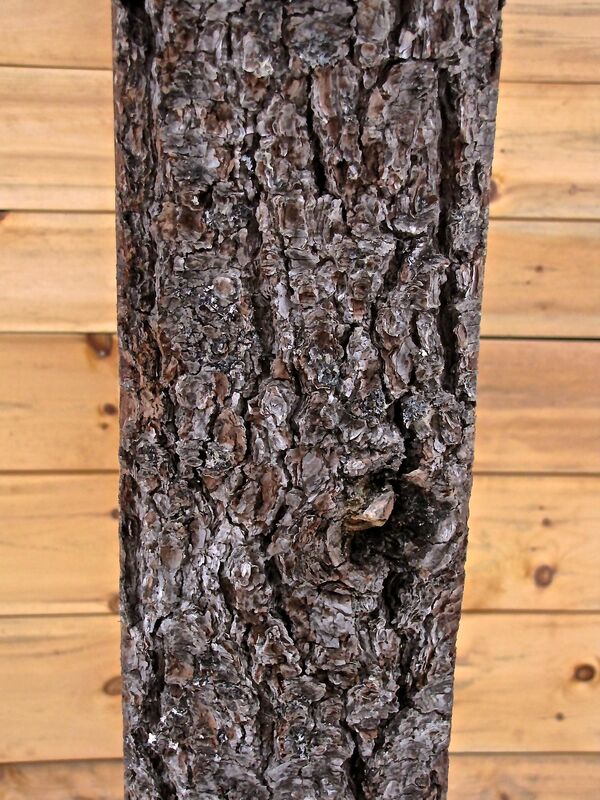 Between the covers you’ll find information about bark structure, types of bark and bark ecology. There is a key for those who are so inclined. And then the biggest chunk of the book is devoted to photographs and descriptions for each type of tree that grows in our New England and eastern New York State forests. 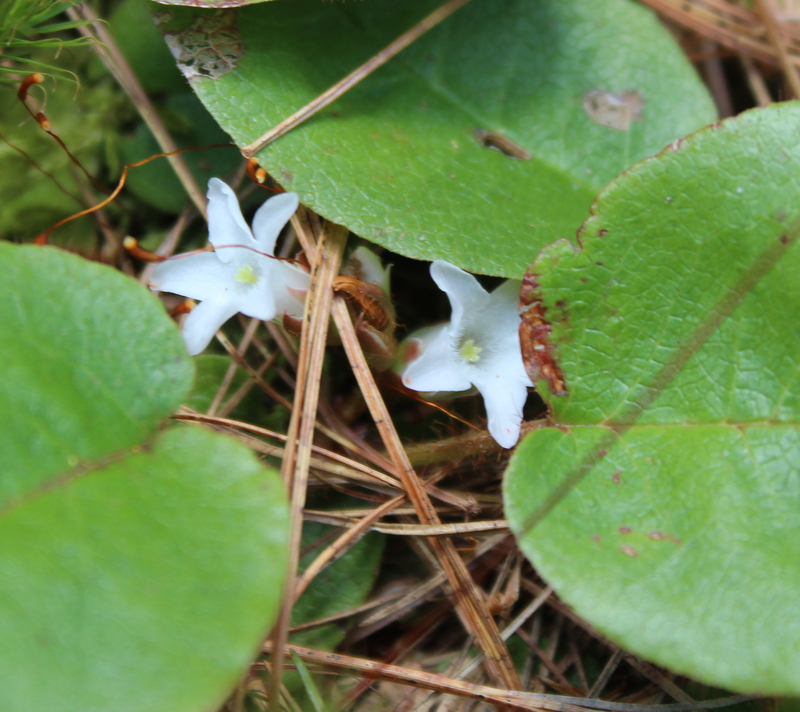 These include the common and Latin names, family, habitat, range maps, leaf and branch pattern, leaf shape and notes. For me, there are two take away items from this book. 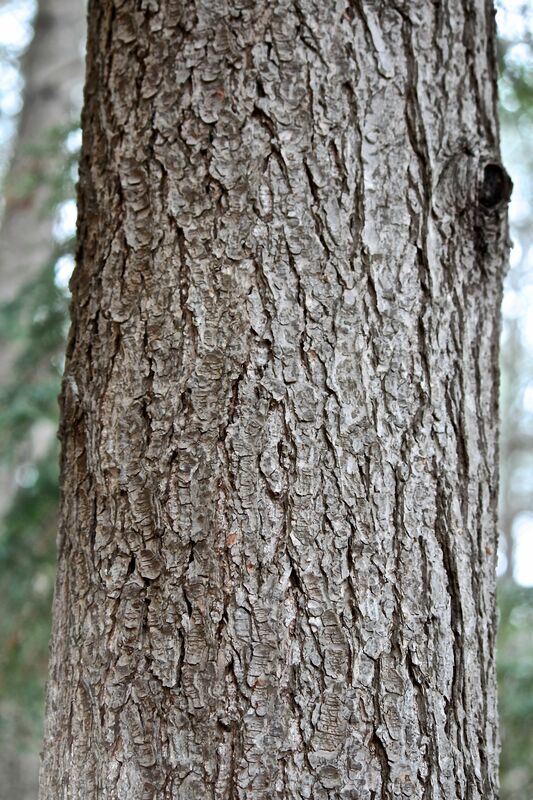 First, I learned to categorize bark based on its pattern from smooth to ridges and furrows, vertical strips, curly and peeling to others covered in scales and plates. 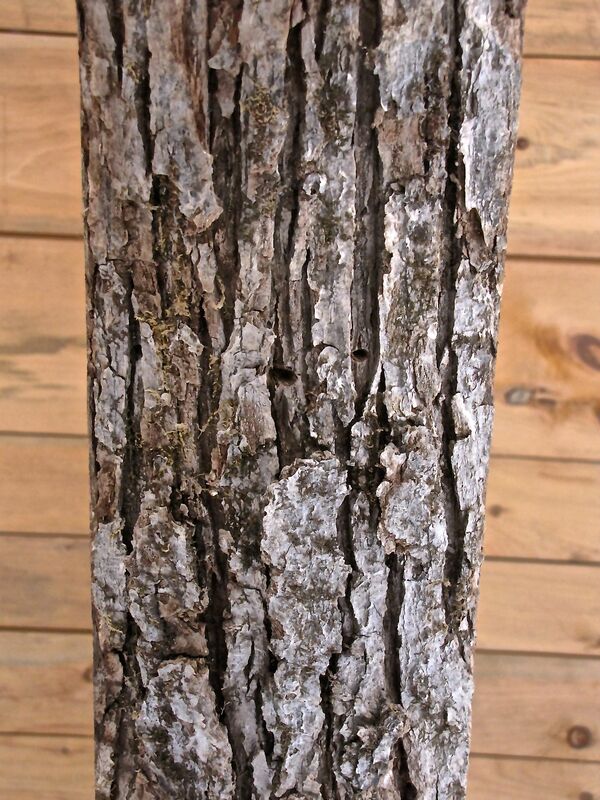 He breaks bark type into seven varieties that I now find easy to identify. 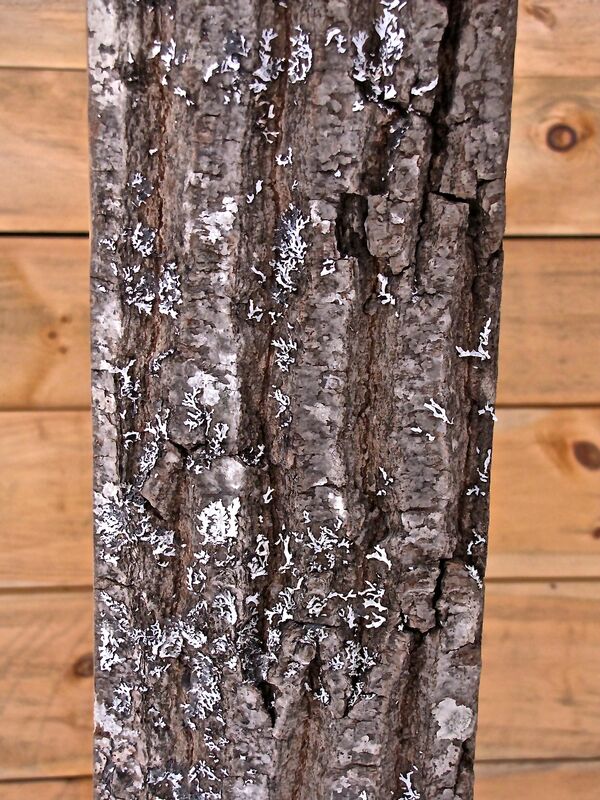 Second, I came to realize something that I may have known but never gave much thought to–except for American beech bark, which remains smooth all its life (unless it’s been infected by the beech scale insect), bark differs from young to mature to old for any particular species. Oy vey! Though this book is useful in the winter, now is the time to start looking. To develop your bark eyes. The leaves are on and will help with ID, thus you can try the key and you’ll know if you’ve reached the correct conclusion or not. While you are at it, I encourage you to visit the small western Maine town of Bridgton, where the Bob Dunning Memorial Bridge leads into Pondicherry Park. 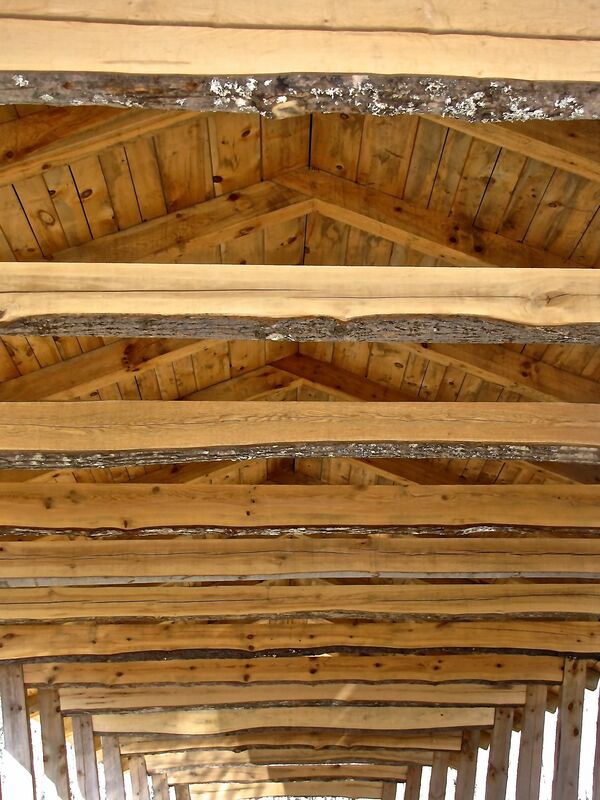 Each of the sixteen bridge beams is constructed from a different tree and the bark is still on them. Test yourself and then grab one of my brochures at the kiosk to see if you got it right. If there are no brochures, let me know and I’ll fill the bin. And while you are there, stop by the independent bookstore, Bridgton Books, to purchase a copy of BARK. 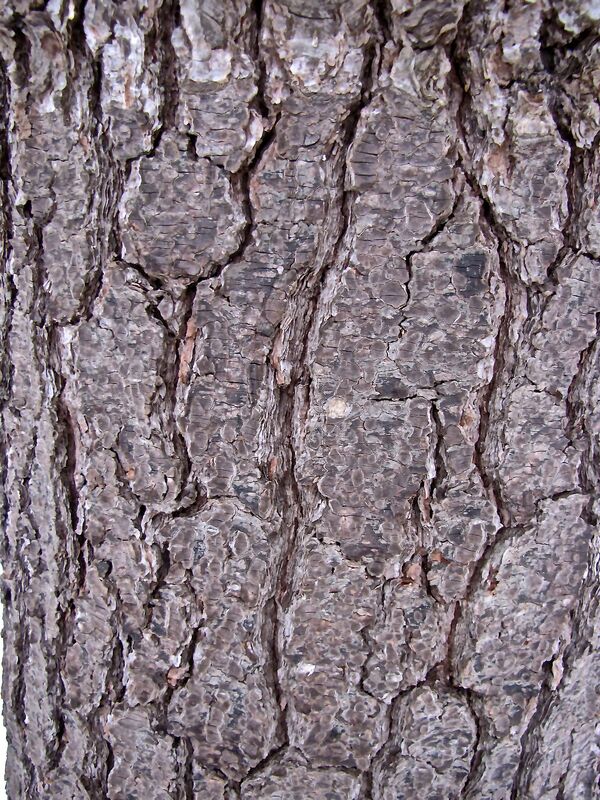 BARK: A Field Guide to Trees of the Northeast by Michael Wojtech, University Press of New England, 2011. 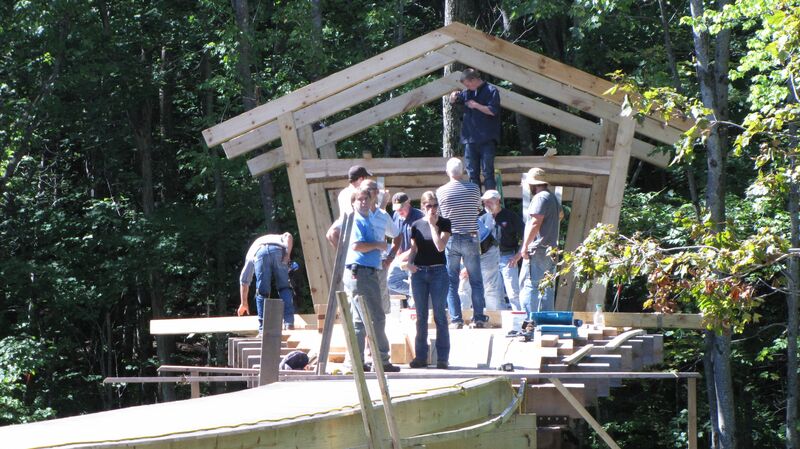 On September 11, 2010, the Bob Dunning Memorial Bridge was constructed in true barn-raising fashion. 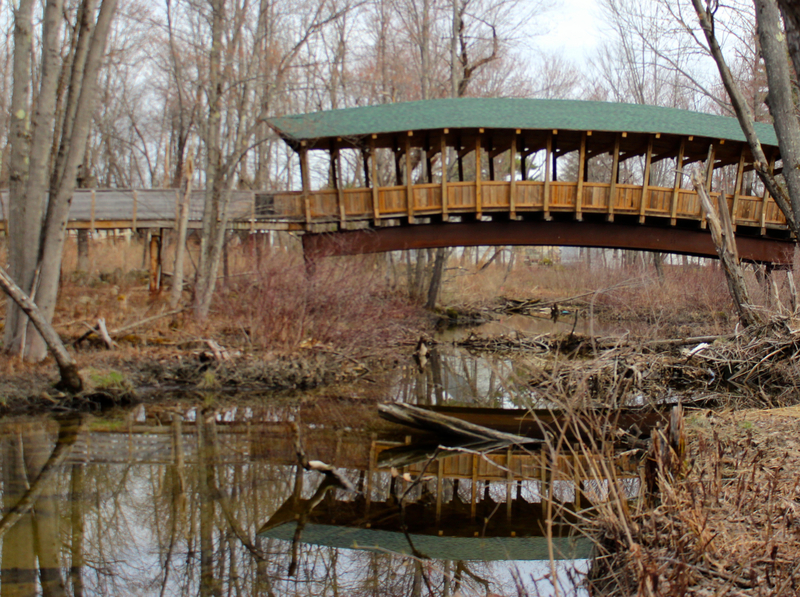 The bridge is a key feature of Pondicherry Park in downtown Bridgton. Bob Dunning, who died suddenly, was a builder, an artist, and among other things, a teacher–sharing his craft with students young and old. 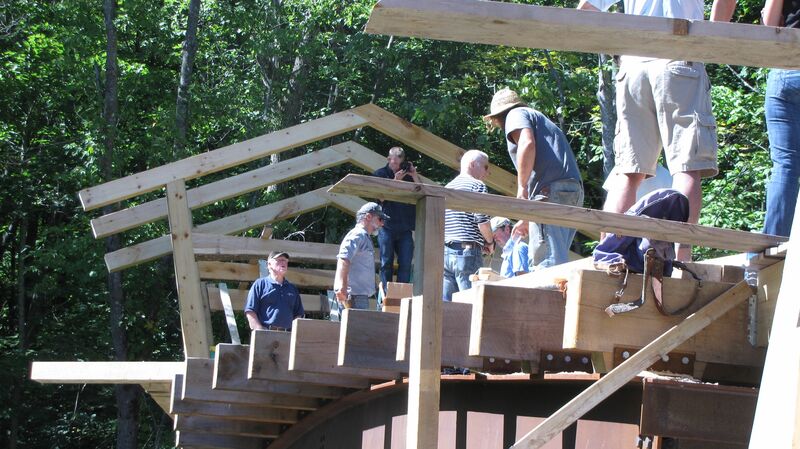 To honor Bob, who treasured traditional building techniques, his friends and fellow craftsmen designed and built a covered bridge leading into the park. 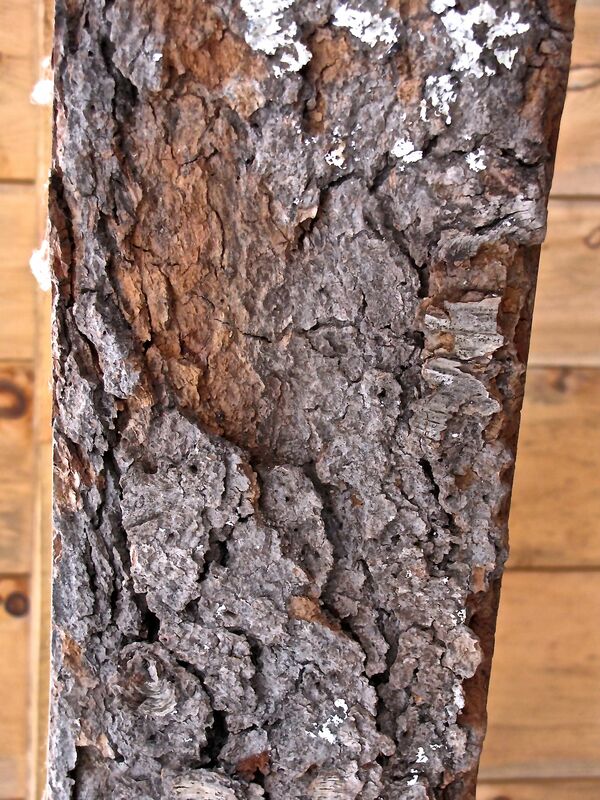 One of the unique things about the bridge is that each tie beam comes from a different tree species, with the bark left on. As I walk across the bridge, my eyes are always drawn to the beams. 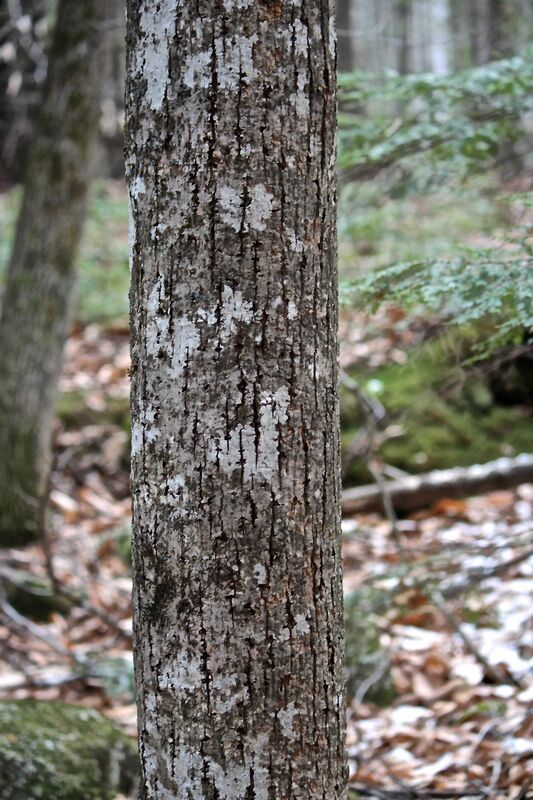 Until I took the Maine Master Naturalist class, I recognized only a few species by their bark. But my eyes were opened to the fact that each species has its own presentation, which is true for everything in the natural world. I wanted to know all of them so I set out to teach myself, beginning with the species on the bridge. These became the focus of my capstone project for the class. 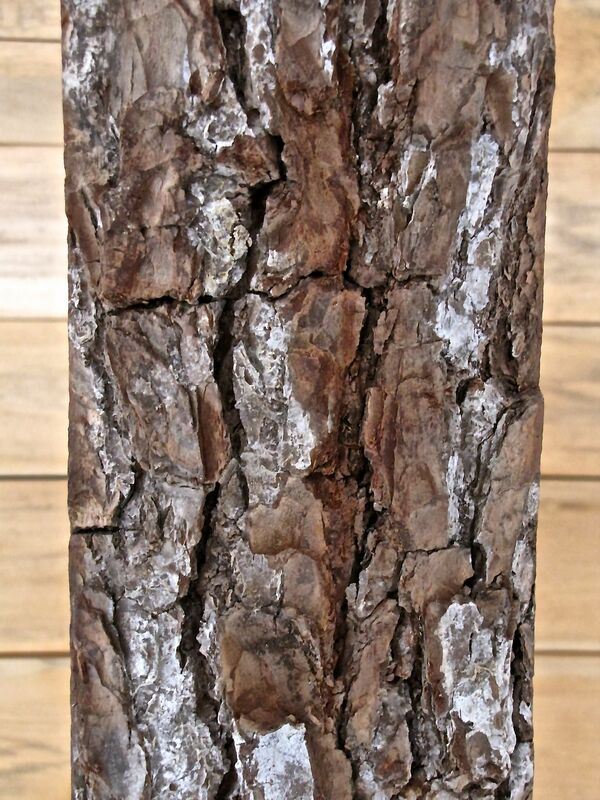 I spent hours upon hours pouring over reference books such as BARK by Michael Wojtech, The Tree Identification Book by George Symonds, Manual of Trees of North America by Charles Sargent and Forest Trees of Maine by The Maine Forest Service. I sat in front of trees and sketched them, trying to gain a better grasp of their nuances. I dragged foresters into the field and picked their brains. And I drove hiking companions crazy as I tried to point out clues. The result was a brochure that you can pick up at the kiosk (let me know if you can’t find a copy) and a powerpoint presentation that breaks down the species by types of bark. 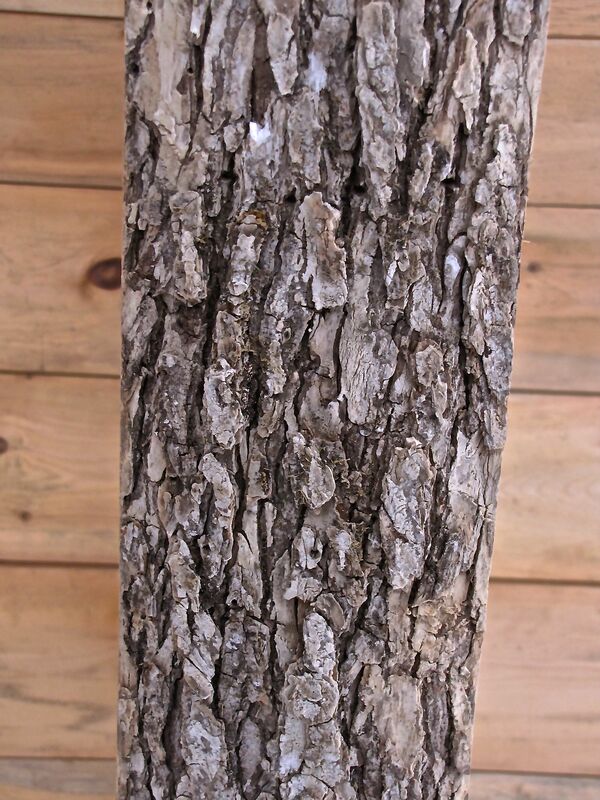 Did you know that there are seven types of bark? I learned that from Wojtech’s book and it made it easier to note the differences. Follow me now, as I take you across the bridge and give you a glimpse of each tree. We’ll begin on the east side (closest to Renys) and work our way west. 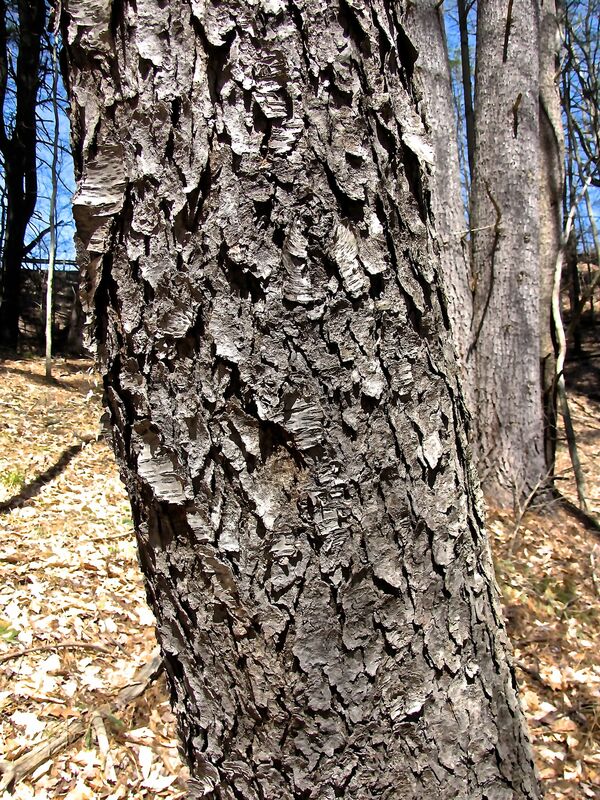 Beam #1: Black Cherry (Prunus serotina): Scales; gray-brown to almost black; small, rough scales randomly placed; curled outward like burnt cornflakes or potato chips. 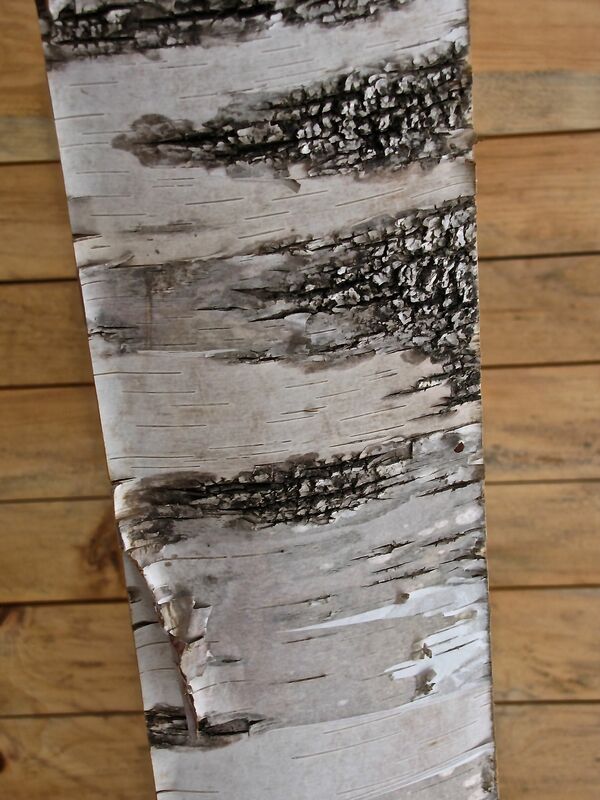 Beam #2: Yellow Birch (Betula alleghaniensis): Peeling/Curling; bronze to yellowish-gray; curls away horizontally into thin, papery strips; shaggy appearance. 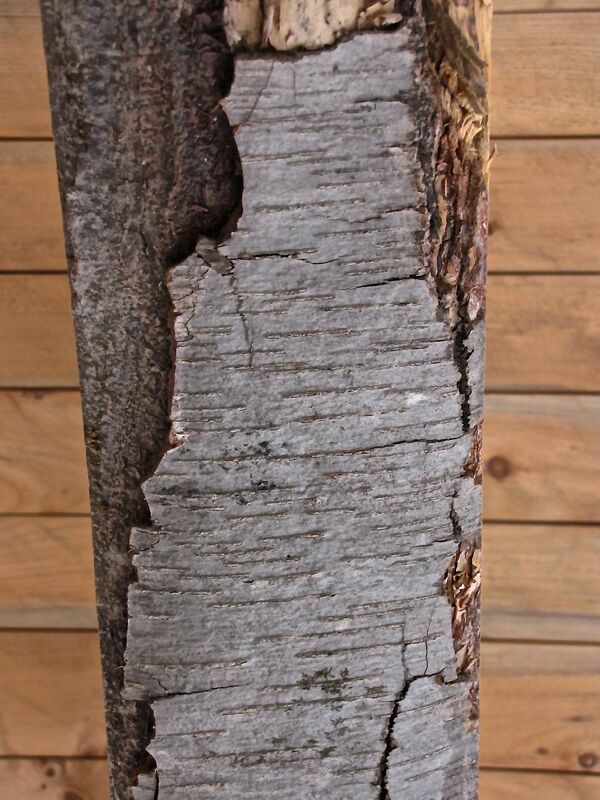 Beam #3: Red Maple (Acer rubrum): Vertical Strips; light to dark gray; almost smooth or cracked vertical, plate-like strips; curls outward on either side; sometimes bull’s eye target caused by fungi. 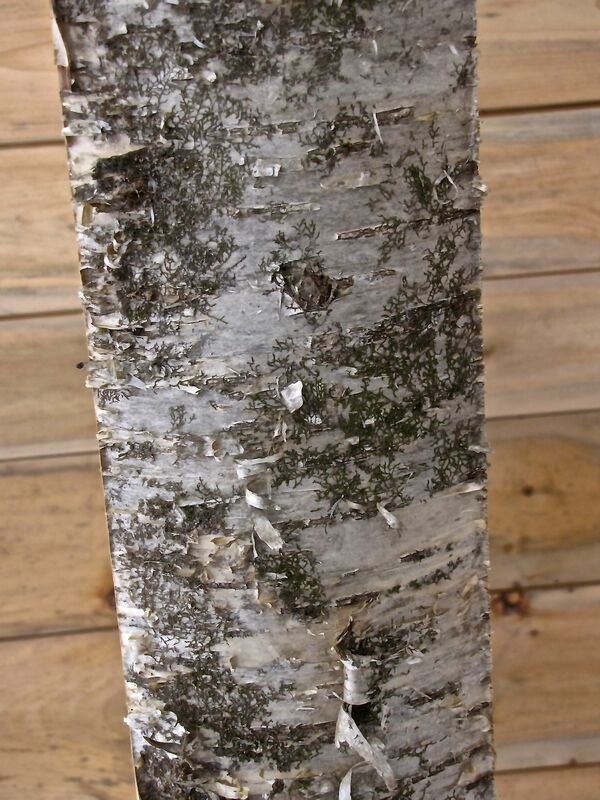 Beam #4: American Basswood (Tilia americana): Ridges; gray to brown; flattened, square-like ridges with parallel edges; may intersect like a woven basket every 6-12 inches. 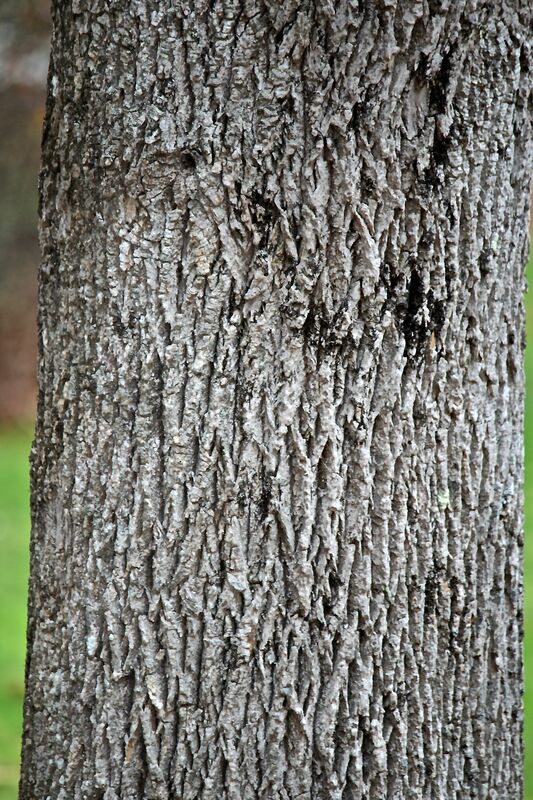 Beam #5: Northern Red Oak (Quercus rubra): Ridges and Furrows; light colored, with rusty red inner bark; wide, flat-topped ridges run vertically parallel like ski tracks; dark, shallow furrows separate ridges. 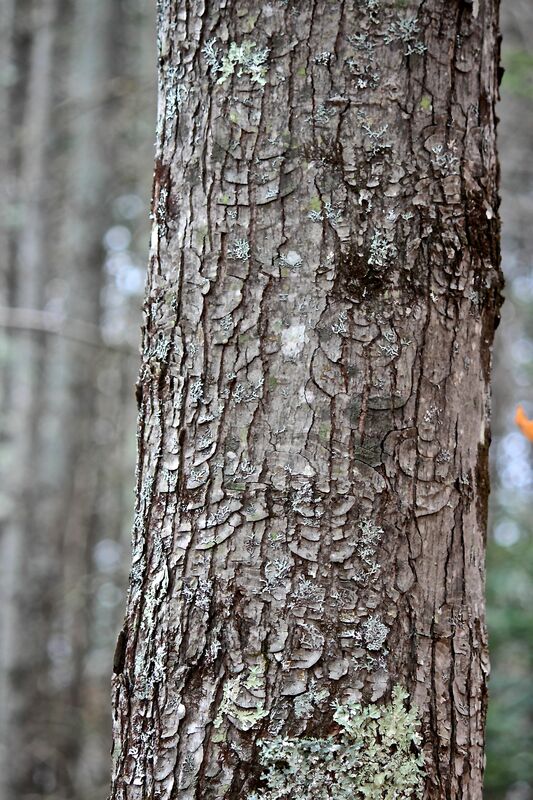 Beam #6: Eastern Hemlock (Tsuga canadensis): Scales; cinnamon-red to gray; rounded or irregularly-shaped scales; inner bark has purplish tint. 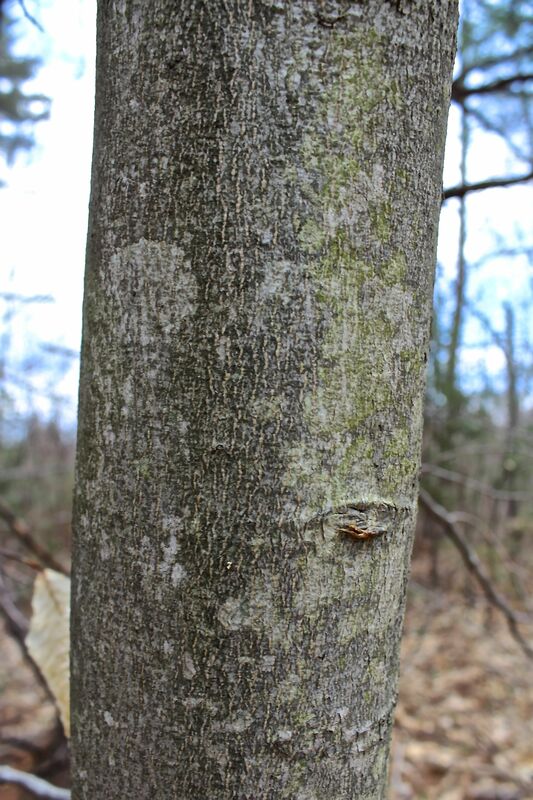 Beam #7: American Beech (Fagus grandifolia): Smooth/Unbroken; silver-gray or grayish-green; sometimes blotched with lichen; carved initials remain visible forever; often pockmarks caused by fungi. 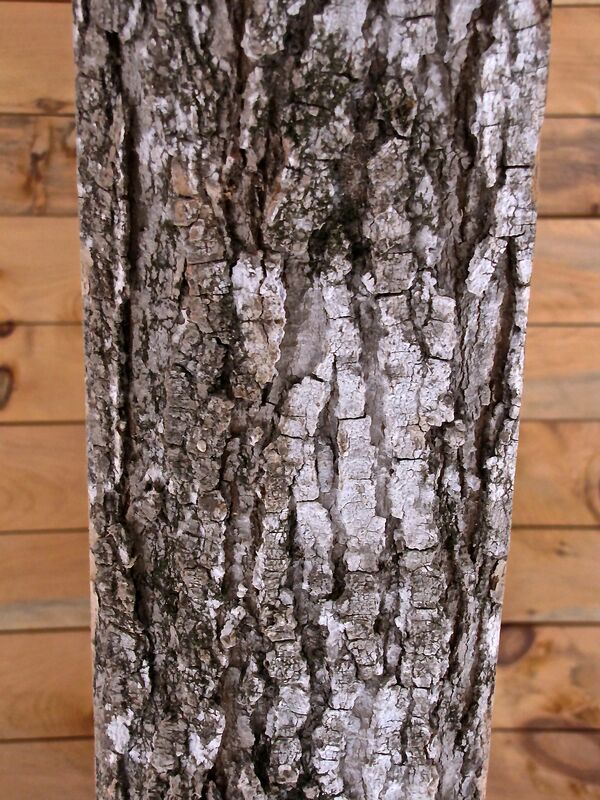 Beam #8: White Ash (Fraximus americana): Ridges and Furrows; ashy-gray to brown; intersecting ridges form obvious diamond-shaped furrows; look for letter “A” or pattern of cantaloupe rind. 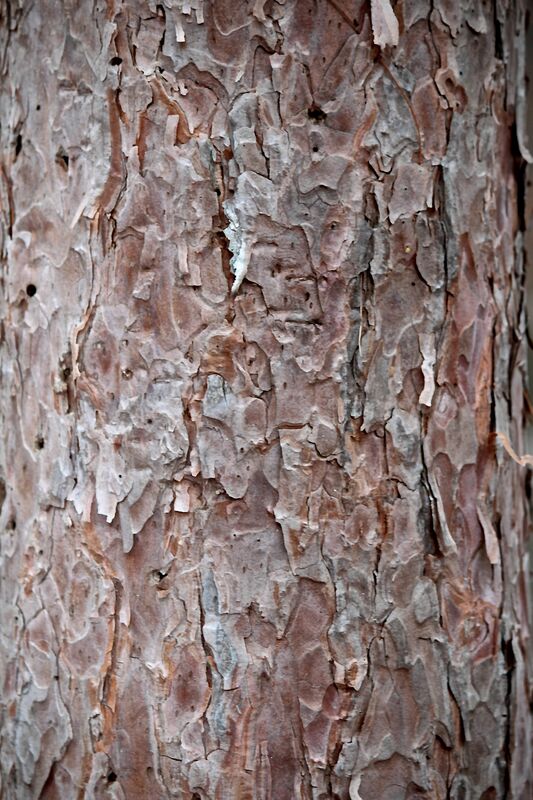 Beam #9: Eastern White Pine (Pinus strobes): Scales; dark gray to reddish-brown; thick, irregularly-shaped scales; fine horizontal lines evenly spaced along scales like lines on a legal pad. 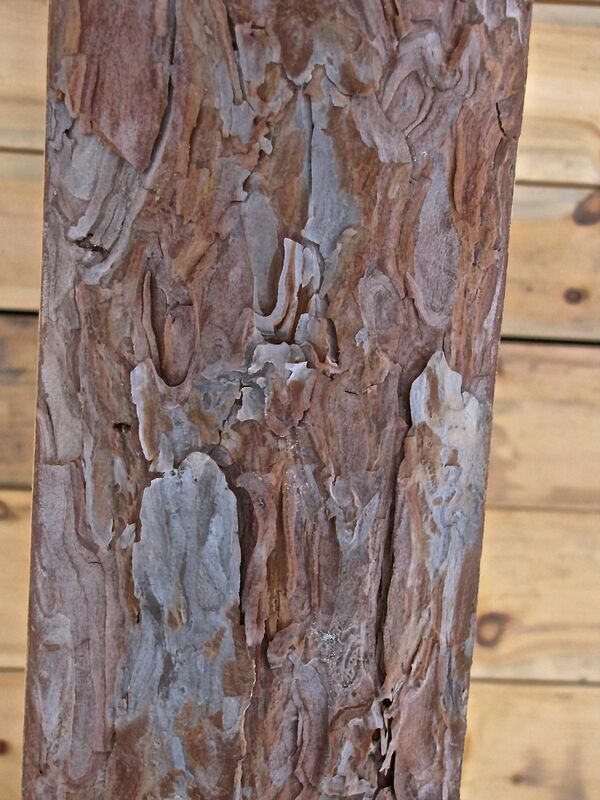 Beam #10: Red Pine (Pinus resinosa): Scales; mottled red and grayish-brown; flaky scales; jigsaw puzzle or sandstone appearance. 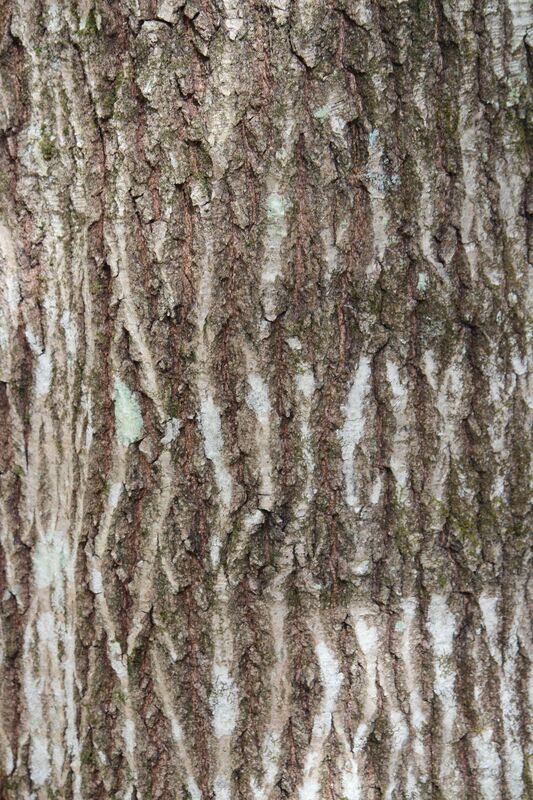 Beam #11: Sugar Maple (Acer saccharum): Vertical Strips; gray to brown; finely cracked; looks like old paint; curls away from trunk on one side; look for horizontal scars indicating work of maple sugar borer. 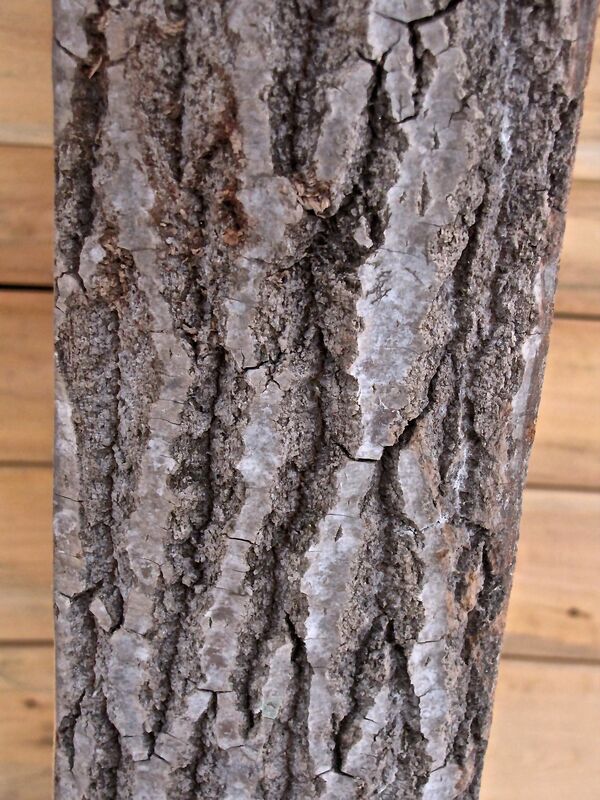 Beam #12: Big-Tooth Aspen (Populus grandidentata): Ridges and Furrows; greenish-brown to dark gray; V-shaped furrows intersect every 6-12 inches; flattened ridges appear sanded down; gnarly look; periodic horizontal lines; on older trees resembles Northern Red Oak at bottom and Birch toward top. 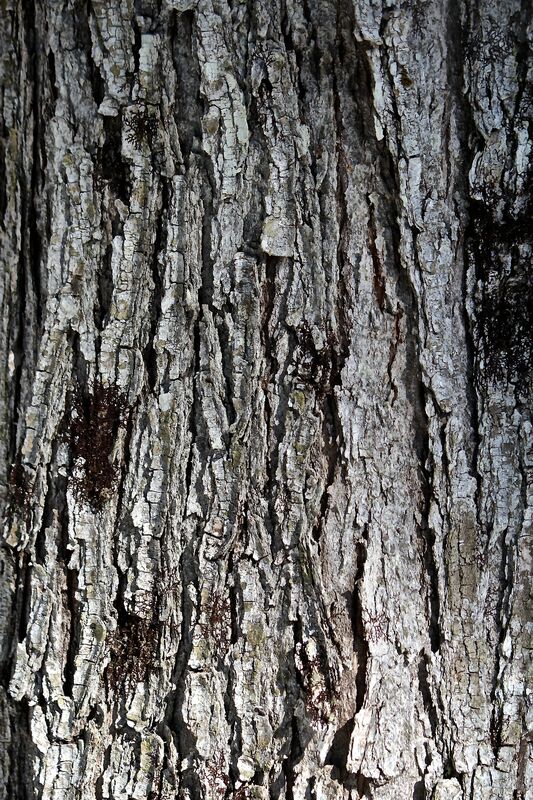 Beam #13: White Oak (Quercus albra): Ridges; light gray with reddish cast; rectangular-shaped blocks with flaky surfaces; ends of blocks curl outward; feather-like in mature trees. 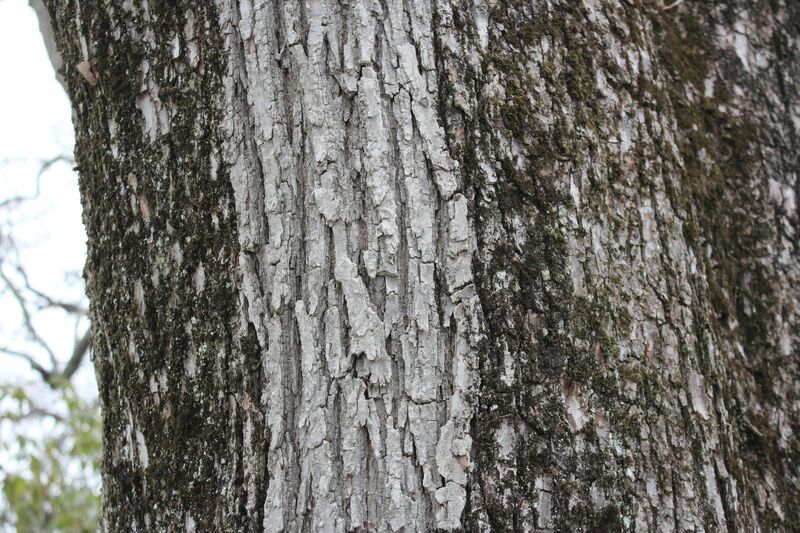 Beam #14: American Elm (Ulmus americana): Ridges and Furrows; ashy-gray; diamond-shaped furrows; flat-topped ridges; alternating light and dark layers like vanilla and chocolate wafer cookies. Beam #15: Black Birch (Betula lenta): Lenticels Visible (note: all trees have lenticels, but they are more obvious on some than others. 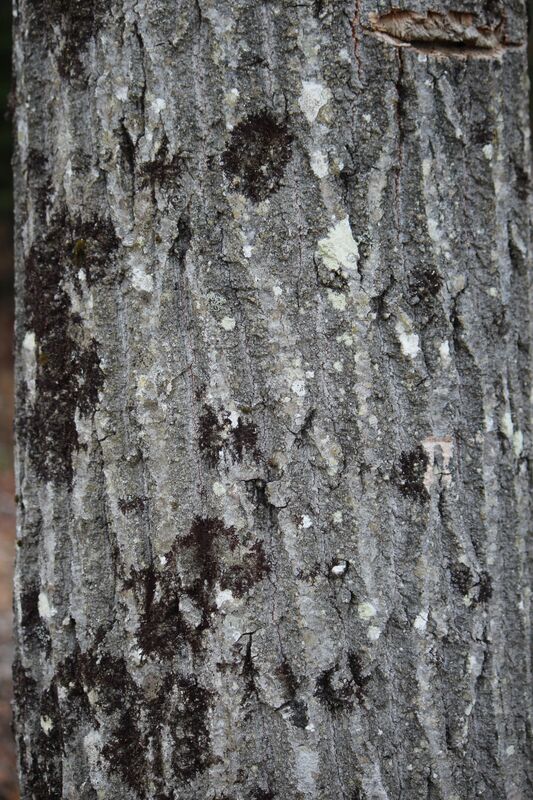 Lenticels are tiny slits in the bark that allow for gas exchange, just like our pores); gray to brown-gray to black; may crack and form scales that curl away from trunk; long, thin horizontal lenticels. 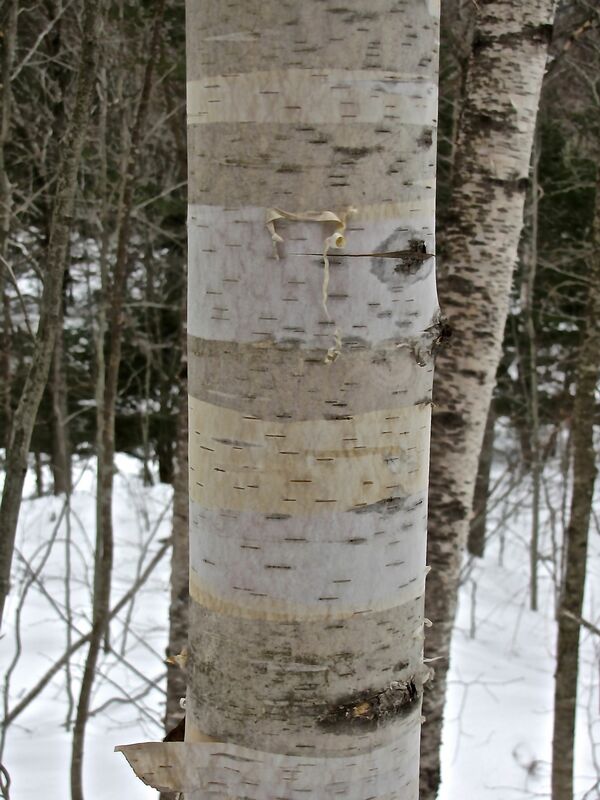 Beam #16: Paper Birch (Betula papyrifera): Peeling/Curling; white to creamy white; peeled bark reveals pink or orange tints; small, horizontal lenticels visible. That’s it in a nutshell. Ah, but here’s the thing. 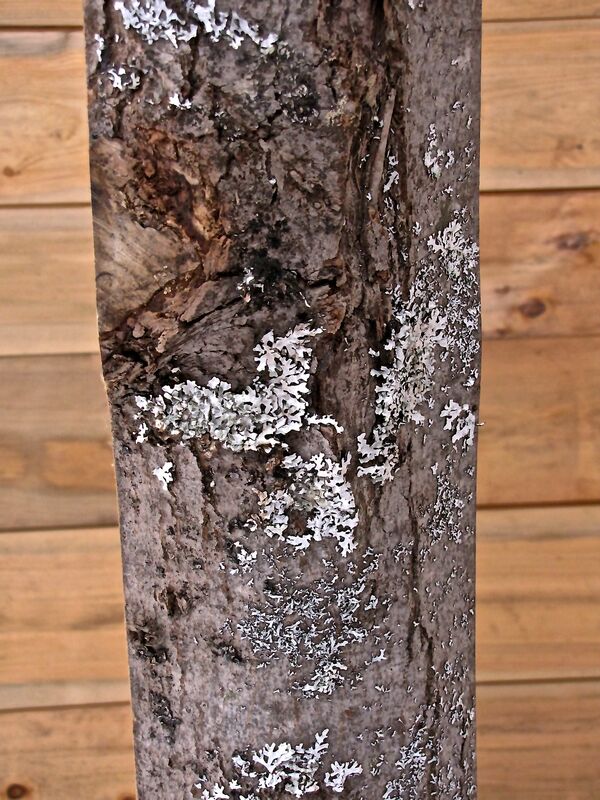 Except for the American Beech, tree bark changes as a tree ages. And beech trees can be equally confusing because some are severely affected by beech scale disease. So, just when you think you know a species, you may come upon a younger or older version and get totally thrown off. 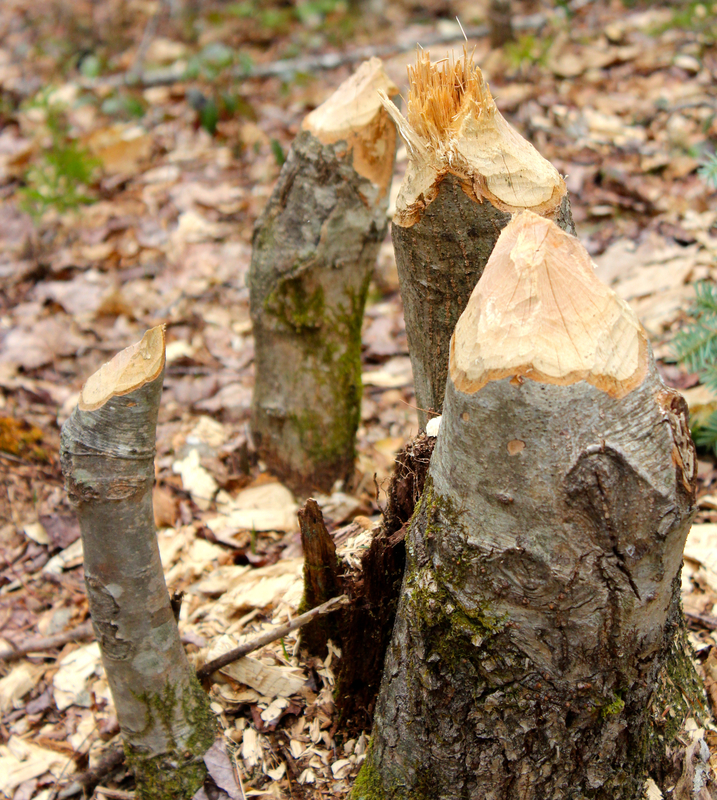 The key is to take your time, walk all the way around the tree, and look at other clues like the twig and bud formation. 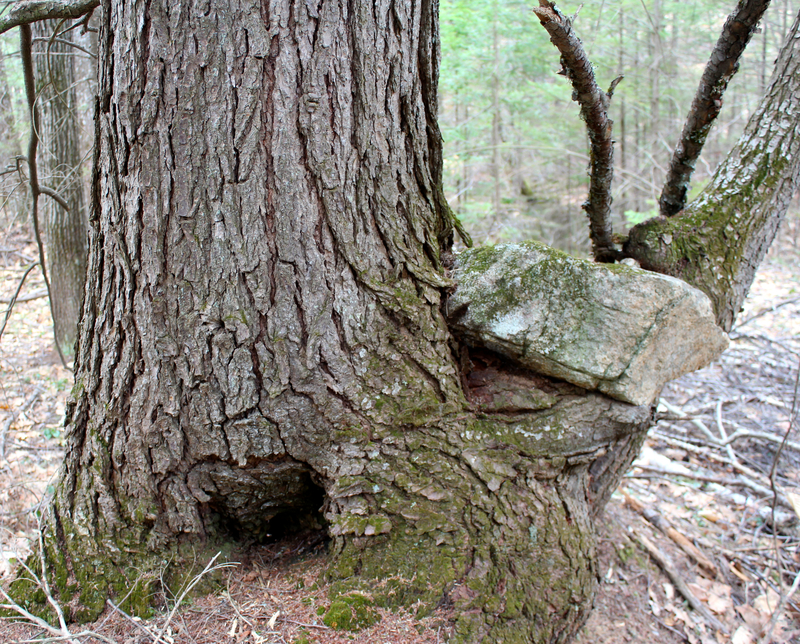 Touch the bark. Smell it. 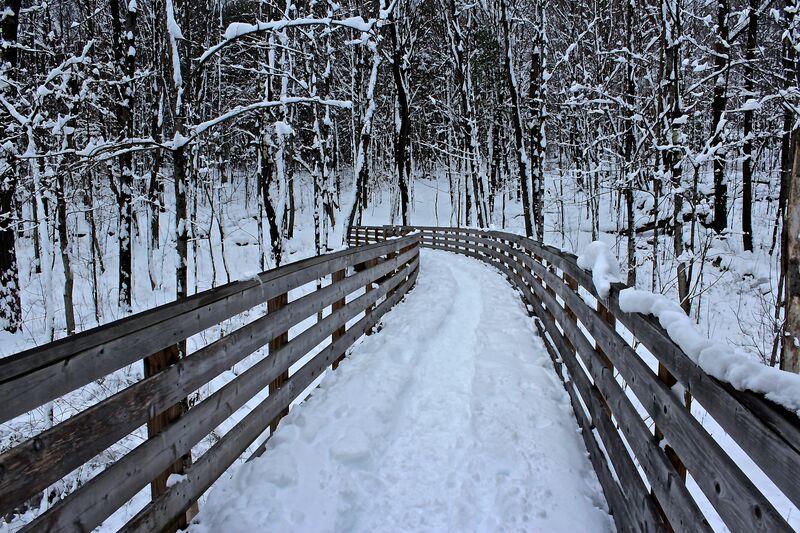 And take a walk across the bridge and into the park during any season. Chances are, I’ll be there doing the same. Thanks for joining me for this lengthy wander. 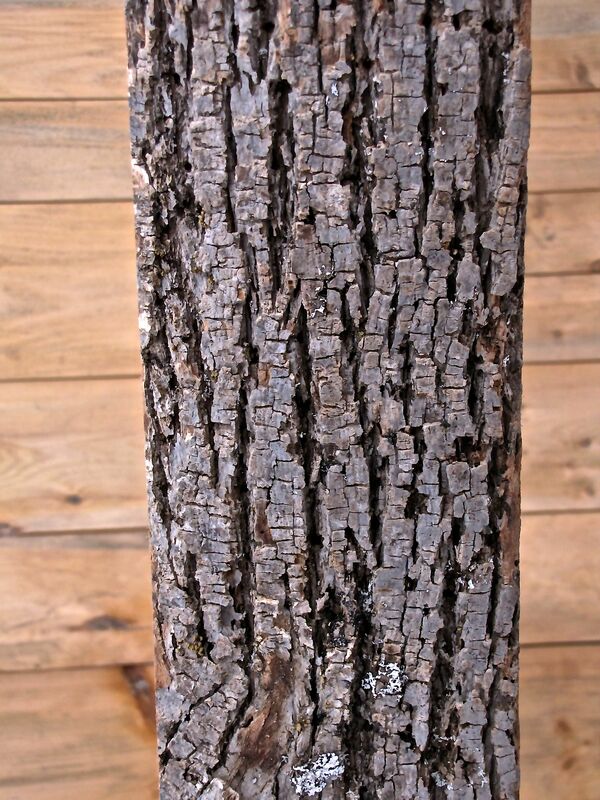 I hope you’ll find time to wonder about bark. And just like that, it’s May. May Day. Memories of our sons quietly delivering flowers to neighbors and friends flashed through my mind this morning. I’ve a feeling they choose not to remember, but at the time they loved sneaking up to doors, depositing small baskets of flowers and then dashing away. 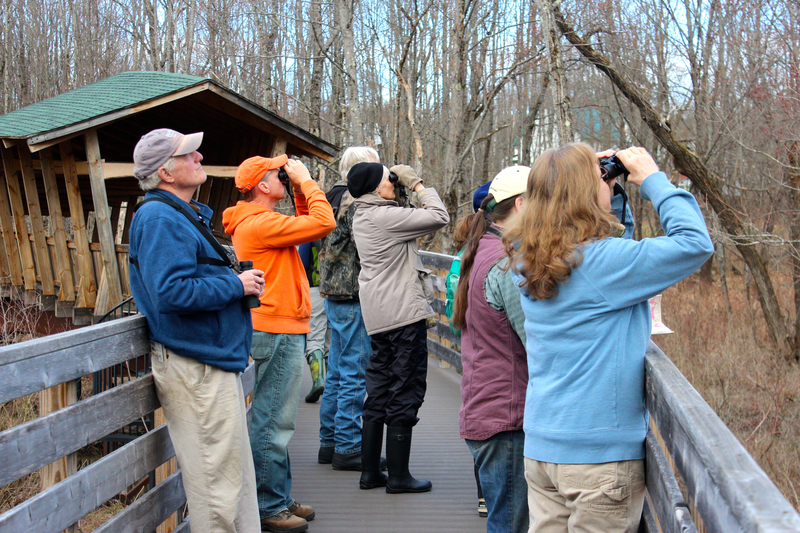 For me, the fun began this morning when I joined a small group intent on birding at the Bob Dunning Memorial Bridge. Chickadees, Red-winged Blackbirds, Pine Siskins, Waterthrush, Mallards, Yellow-rumped Warblers, Goldfinches and a few others were singing and flitting about. The bridge, itself, is worth viewing from any vantage point. And then I drove to Sweden (Sweden, Maine, that is) to join a couple of friends on a tramp through the woods. Along the way, this May Day basket presented itself. 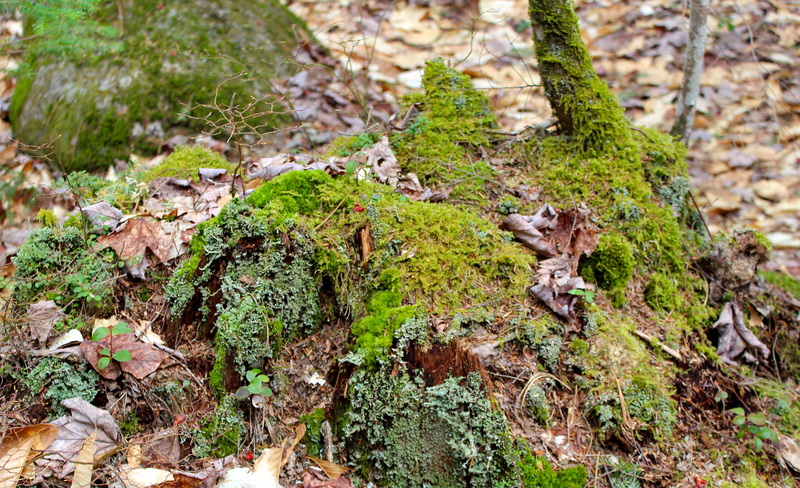 Moss covered rocks and stumps bring to mind my father and his Scottish heritage. 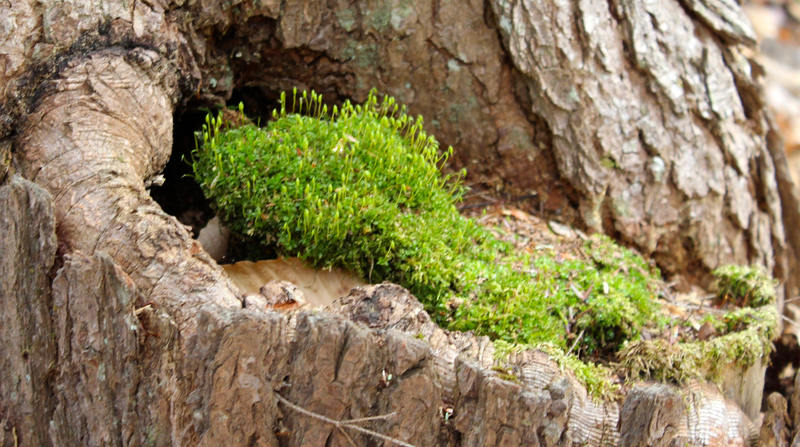 The faeries or fair folk, as they prefer to be known, quietly present themselves in areas like this. Some day, I may share the fairy tale I wrote a few years ago. 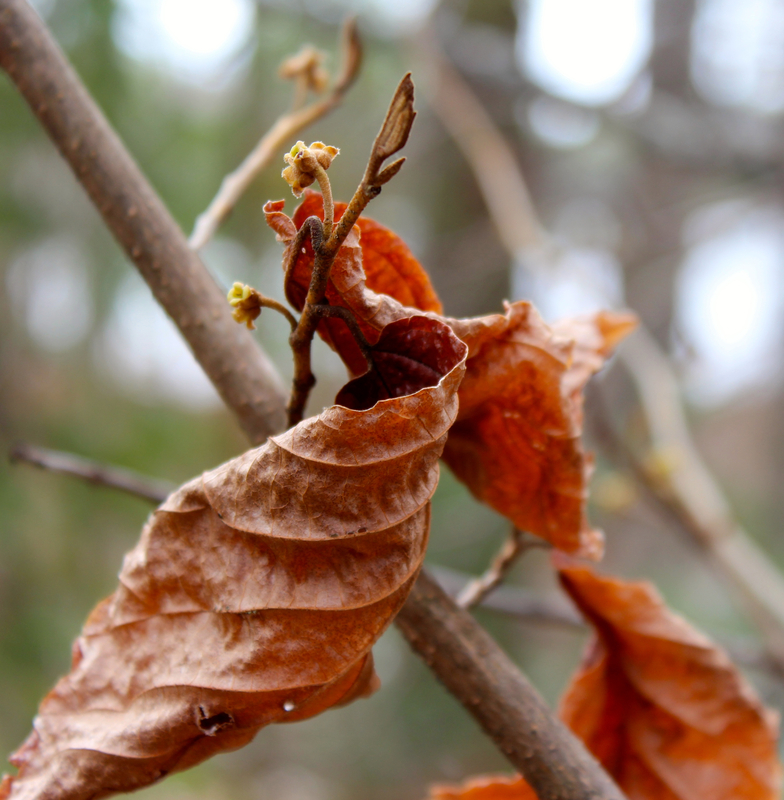 The Witch Hazel still holds its leaves. As do most American beech trees, but this one is beginning to leaf out. 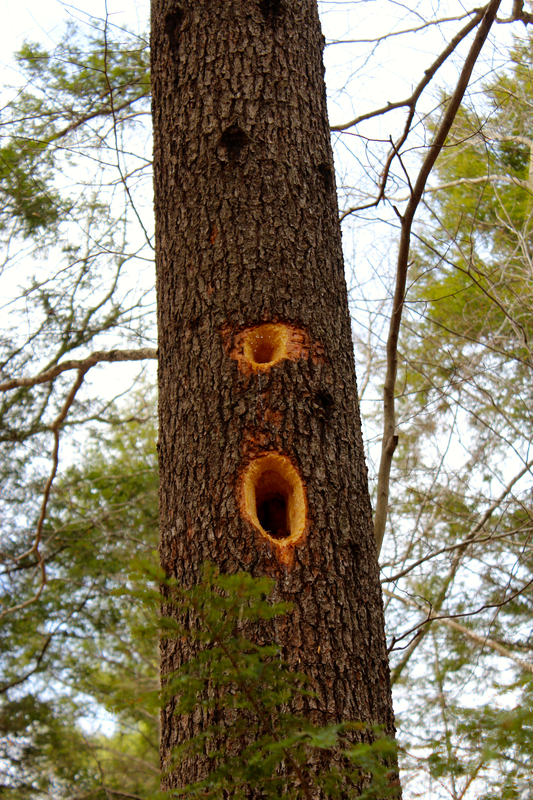 The insects don’t stand a chance against the methodic hammering of the pileated woodpecker who created these holes. 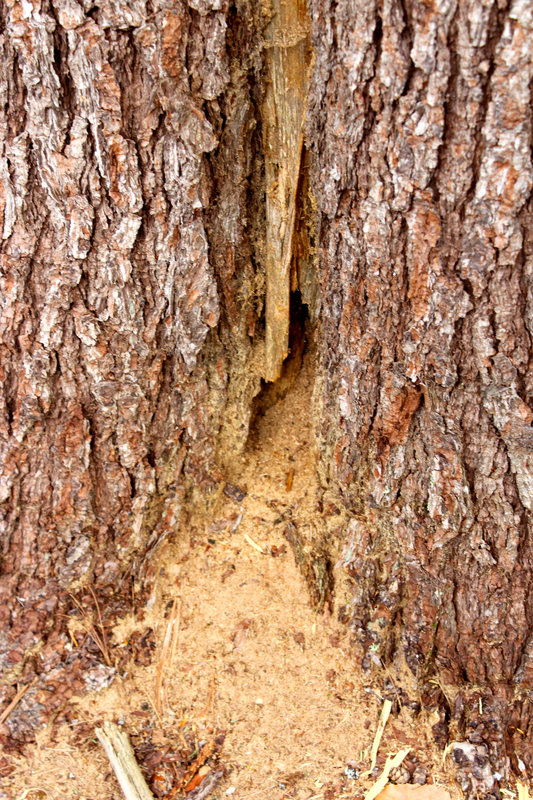 At the base of the tree, the reason for the pileated’s work was revealed; sawdust created by carpenter ants. 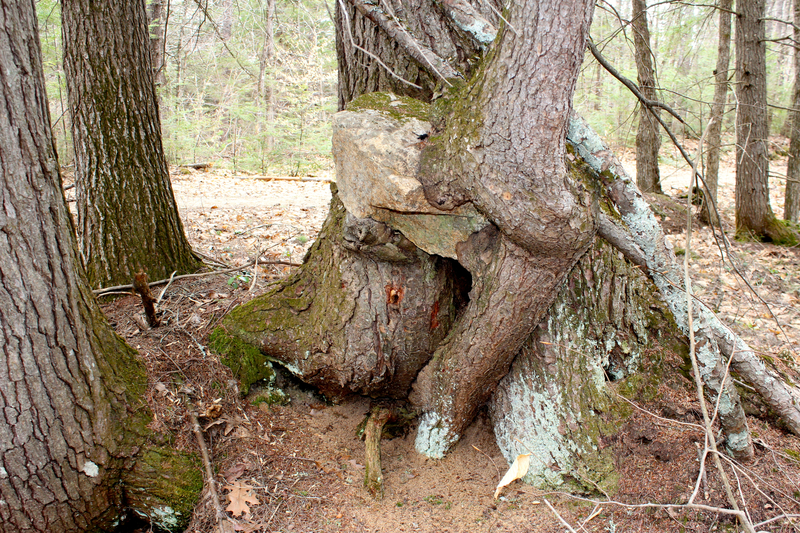 This tree must hum before it drums. I actually stopped talking, ever so briefly, when I saw this. We think we know, but what are your thoughts? 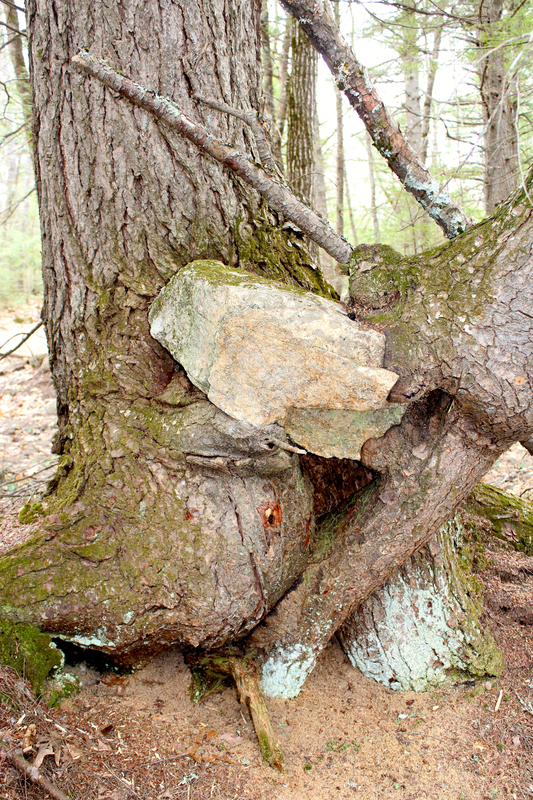 Meanwhile–a tree grows around a rock. One of my favorite wonders of today. 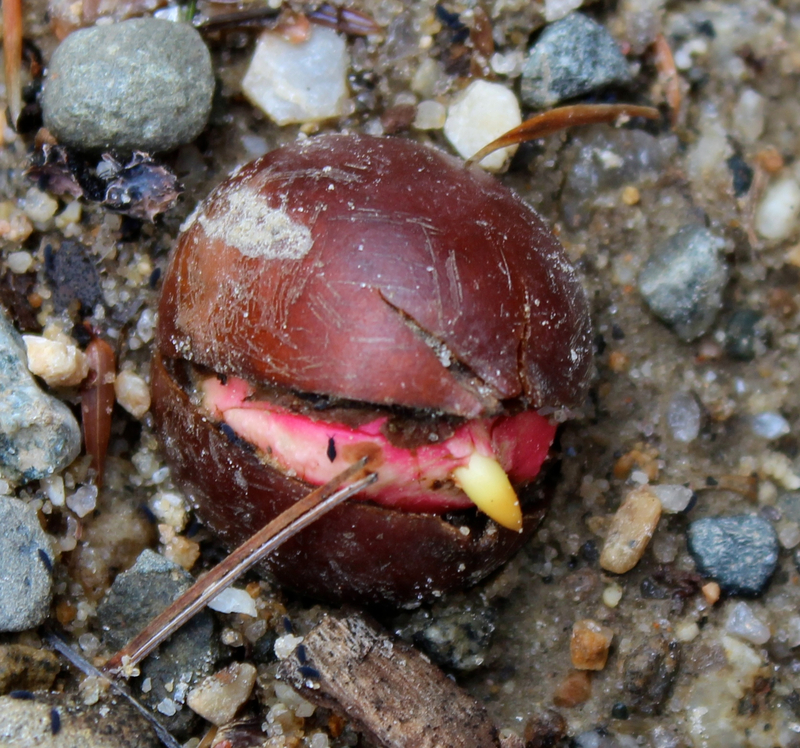 A red oak acorn germinating on the gravelly road–not exactly a quality site to begin life. 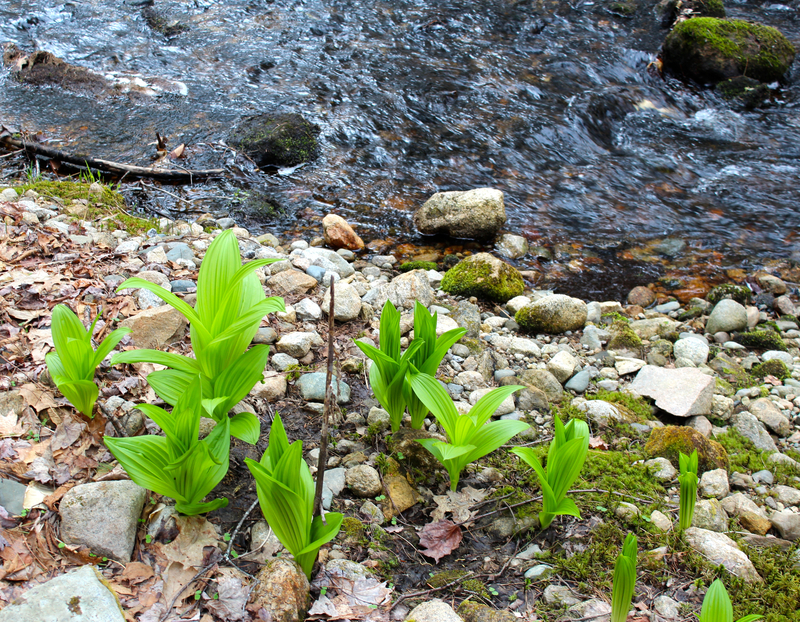 beside Powers Brook as it meanders by on its way to Stearns Pond. 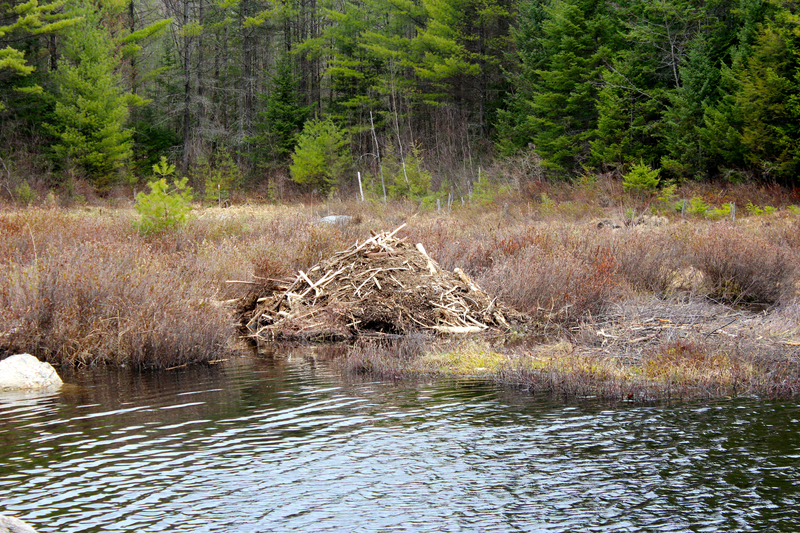 It was a day of this and that, including beaver works. And two large dams, the second being in the background to the center right. 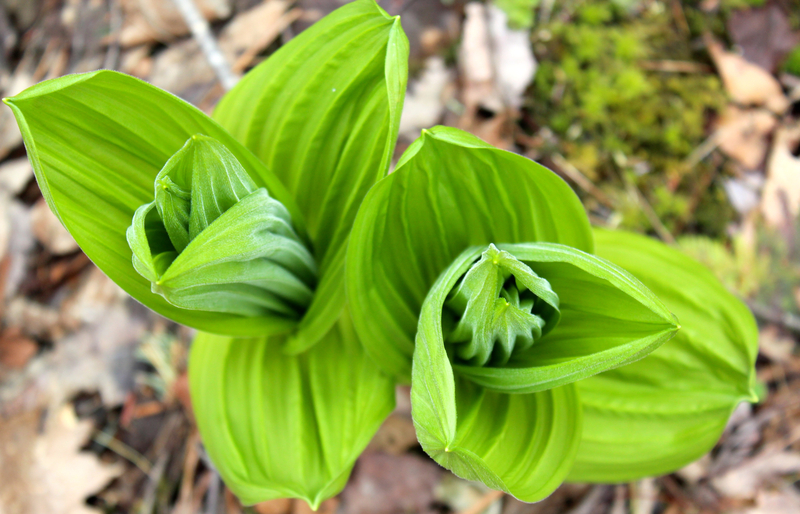 It’s May Day and we noticed that Canada Mayflower is beginning to leaf out. 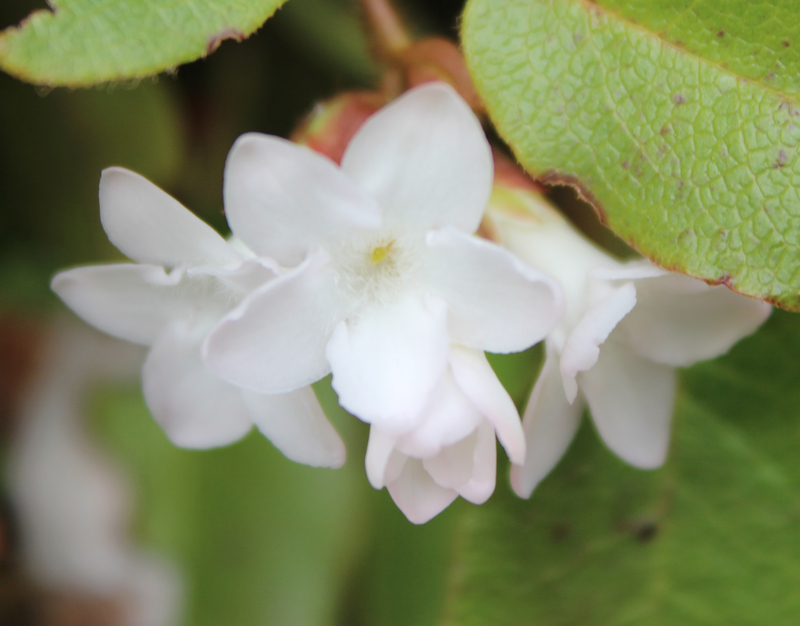 accompanied by that delicate sweet scent. A reason to celebrate. Happy May Day.